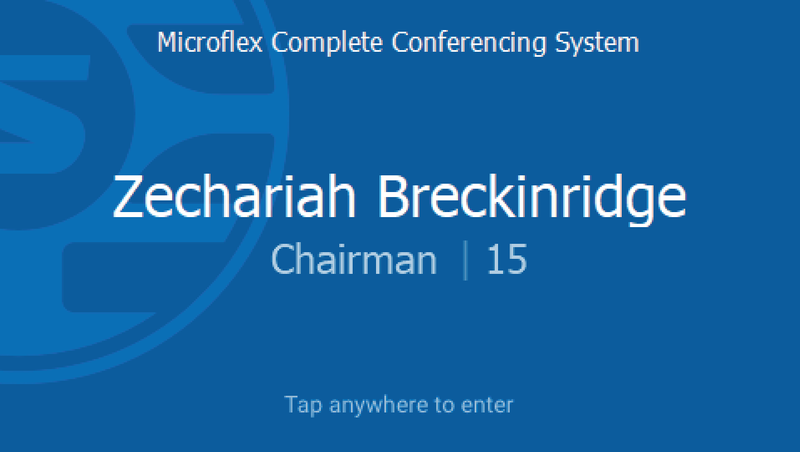 The Microflex® Complete Wireless system offers full conference functionality with the added convenience of encrypted digital wireless transmission for up to 125 conference units. It overcomes cable limitations at off-site meetings, in rooms with flexible seating, or in historic buildings where drilling holes in furniture is impractical. Proven Shure RF interference detection and avoidance technology delivers reliable transmission that protects against signal dropouts, and robust audio encryption keeps meeting content private. Each wireless conference unit is powered by a smart lithium-ion rechargeable battery whose remaining charge (in hours and minutes) can be checked remotely by a technician. RF Efficiency Sound quality is consistent with one speaker or several, and up to 125 units are supported with just one access point transceiver and one RF channel. Automatic Frequency Coordination The system automatically scans the available spectrum and selects clean transmission channels for best performance. Setting up the system is as easy as setting up a wireless router. Interference Avoidance While in use, the system automatically moves away from unexpected interference. Channel adjustment protects against disruption to the audio. Encryption Standard AES-128 encryption of audio and data keeps meeting content private. 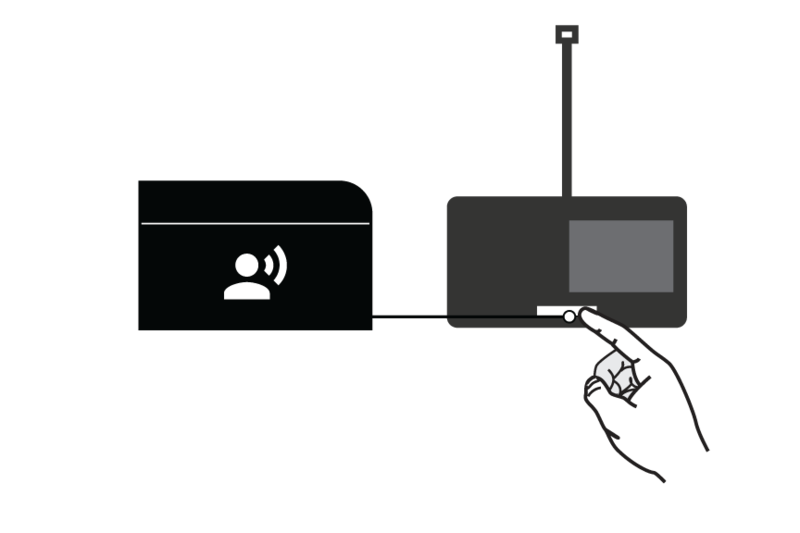 Bi-Directional Wireless Provides return channels for interpretation audio to conference units and enables real-time remote control of conference unit settings. The Shure Microflex® Complete Wireless (MXCW) system provides a steady, reliable audio experience for off-site meetings, flexible meeting rooms, or historic buildings. The system features automatic RF interference detection and avoidance, rechargeable batteries for wireless conference units, encrypted digital wireless transmission, and digital audio networking using Dante™. The MXCW access point has multiple mounting options for discreet communication between wireless conference units and the digital audio network. The access point works within the 2.4 GHz and 5 GHz frequency bands to support up to 125 conference units. 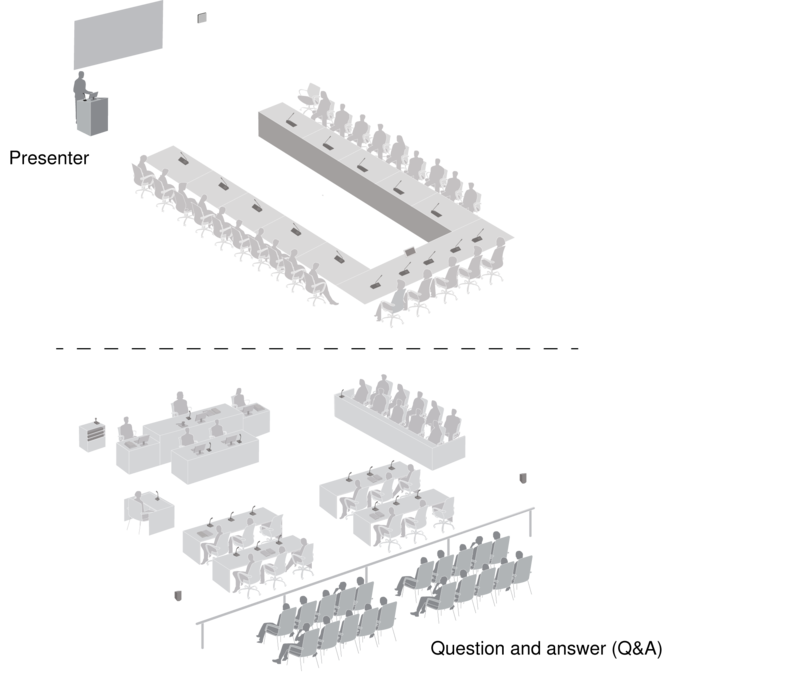 Conference units have configurable roles for meeting participants, and can be routed to the floor audio or an interpretation channel. The MXCW networked charging station charges and stores up to 10 Shure rechargeable batteries that can be monitored through its own web application. 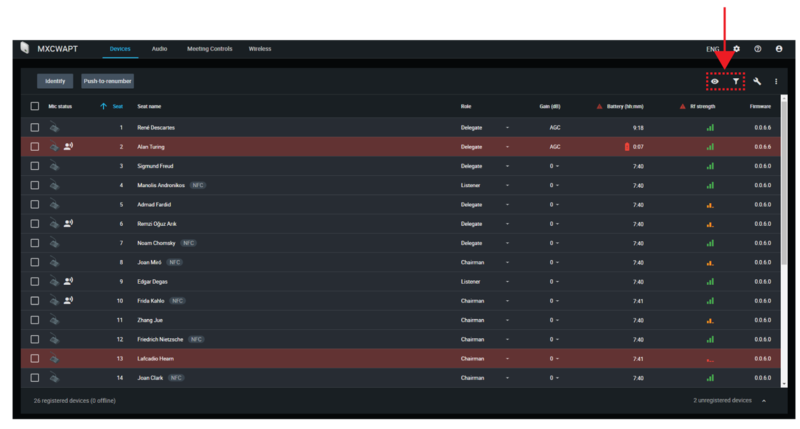 Use the access point web application for system setup, and to monitor and control conference units. 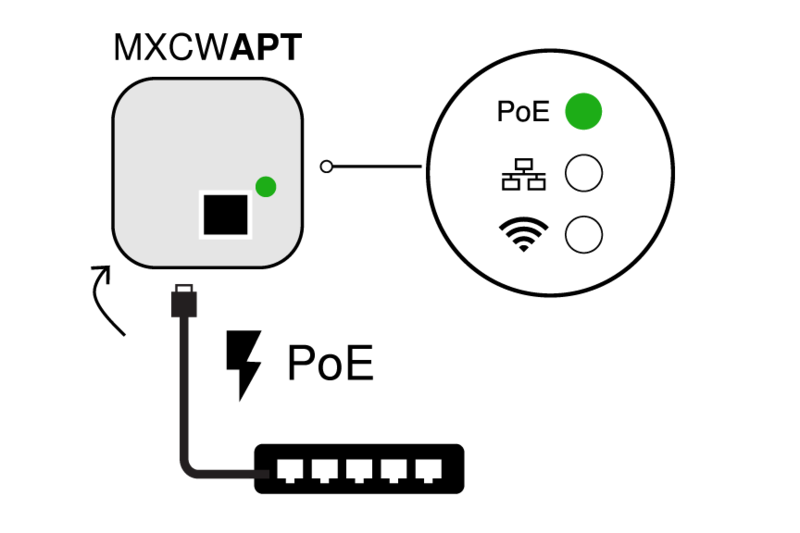 Connect the access point to a Power over Ethernet (PoE) source to turn on the device. If prompted, select the operating region on the menu for RF coordination (some model variations). Wait while the access point scans the area for the best available channel. Once the channel is selected, the default wireless network (00) is ready for the MXCW microphones. Insert a fully charged Shure SB930 rechargeable battery and connect the MXC400 series microphone. 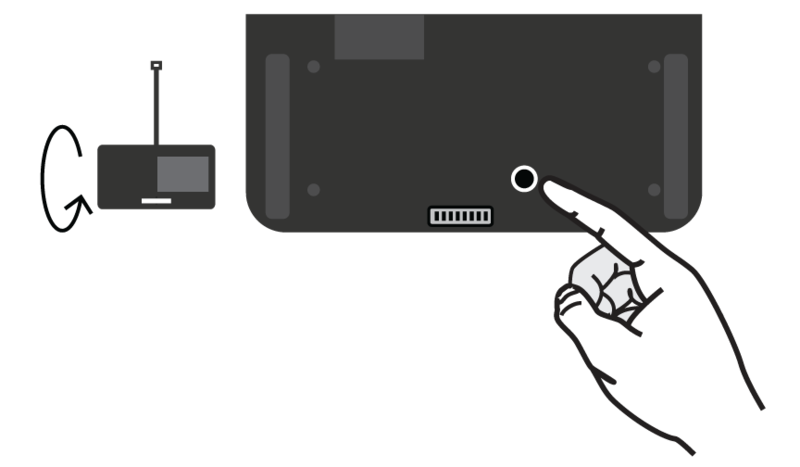 Press and hold the power button on the bottom of the device until the screen powers on. Wait while the microphone device searches for the default access point network (00). The devices are ready when the LEDs briefly flash green and the touchscreen displays the home-screen. Press the speak button on one of the devices to activate the microphone. Speak into the microphone to check the audio. Listen to the sound check on the loudspeakers or headphone output. For more information, visit pubs.shure.com for the full user guide. Transmits an encrypted audio signal to the microphone's headphone output for listening to translated audio or other external sources. Shows menu screens and settings. Use to enter menu screens and save parameter changes. 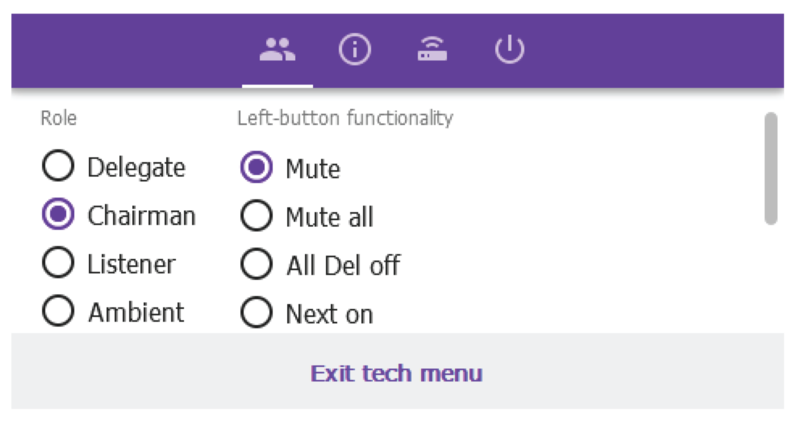 Use to return to previous menu screens or cancel parameter changes. 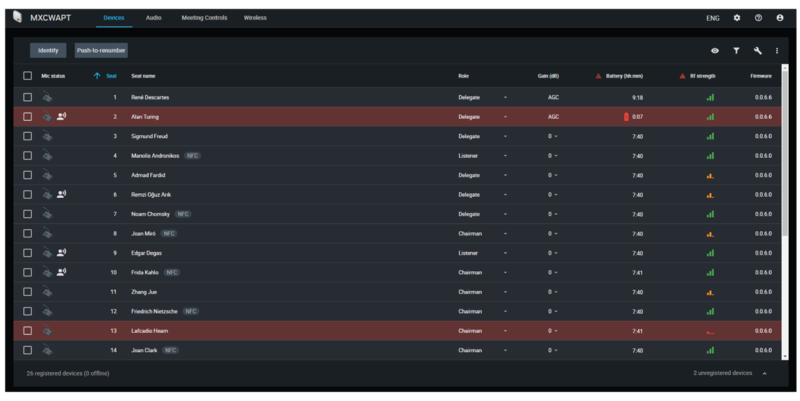 Use to scroll through menu screens and change menu parameters. Illuminates green to indicate the presence of Power over Ethernet (PoE). 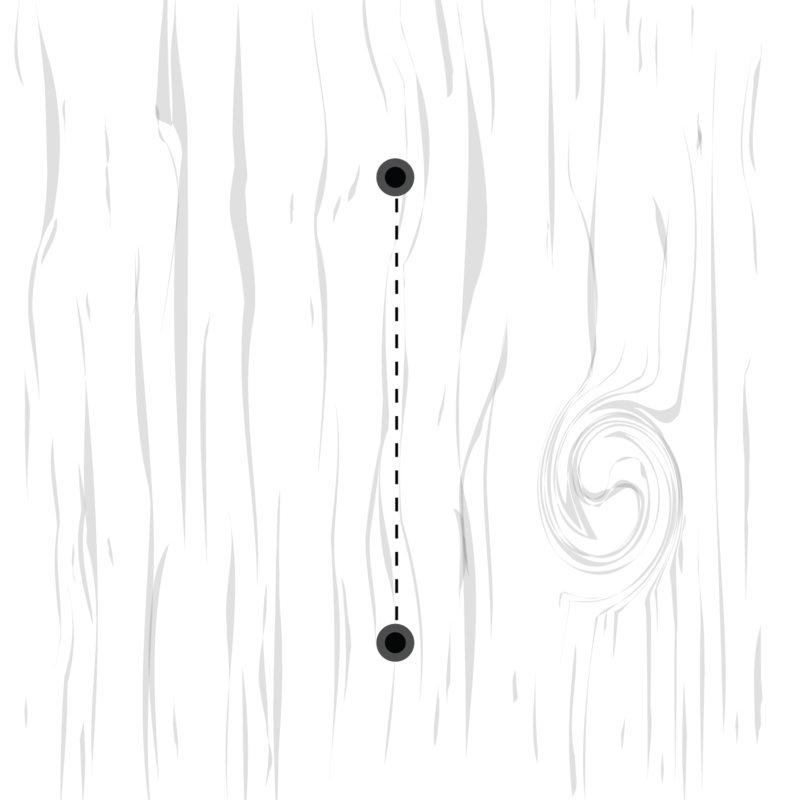 Indicates status of connected Dante network audio channels. Indicates status or wireless connection. Connect to an external input. 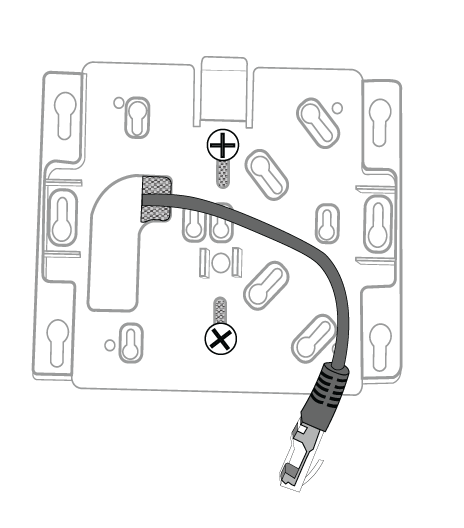 Lifts the ground from pin 1 of the XLR connector and the sleeve of the ¼" Audio Output to minimize ground-related noise that can occur when connecting the XLR Audio Output or Input to a third-party device. The ON position of the switch is labeled lift. Press and hold the reset button for 10 seconds to reset the MXCW system to factory default settings. Paint to match the surrounding decor and snap onto the front plate of the device. The LCD menu and navigation buttons are inaccessible with the cover. Connect a Cat5e (or higher) cable to a PoE source and the network. Provides a path for the Ethernet cable to enable a flush-mount. Allows for optional mounting to a wall, ceiling, or mic stand. Reference the LED indicators on the access point to quickly verify or troubleshoot the system status. Off Powered off (disconnected from network or PoE not present on port). Green Unit is receiving power. Green (flashing) A system reset is in progress. Amber (flashing) A network reset is in progress. Off No Dante channels are routed (receive or transmit). Dante Controller software displays no marks for these channels. Green All connected Dante network audio channels are functional (receiving digital audio as expected). Dante Controller software displays green check marks for these channels. 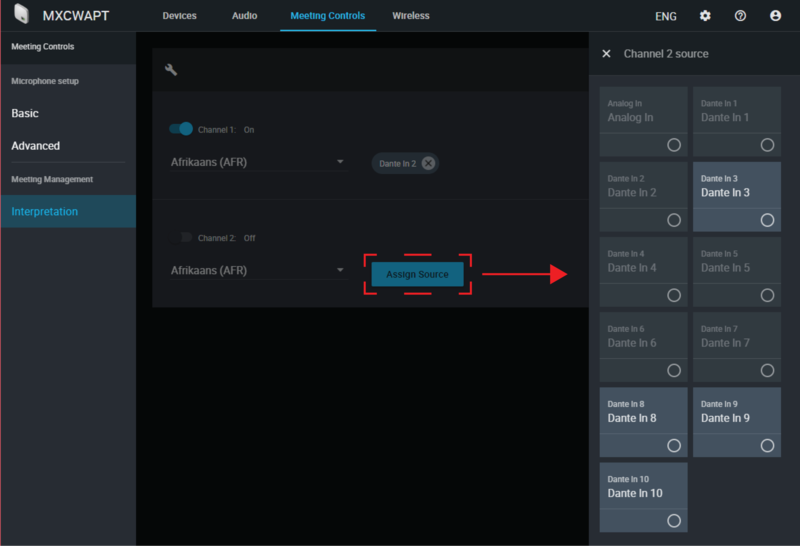 Amber One or more connected (receiving) Dante network audio channels are experiencing a subscription error, or unresolved (transmitting device is off, disconnected, renamed or has incorrect network setting). Dante Controller software displays yellow triangle marks for these channels. Off No connection or set to RF mute. Green Wireless channel secured and RF/wireless audio connected for 1 or more devices. Green/ red (flashing) Detecting wireless interference. Use the access point LCD menu to monitor and adjust system settings without a computer. enter Enter a menu or save a new setting. exit Exit a menu or cancel changes. 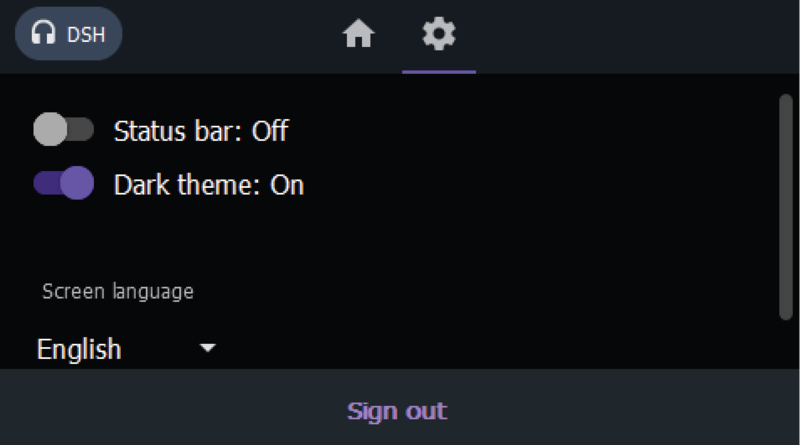 Up/ Down arrows Scroll to a menu item or make a change to a setting. Select an access point network ID for easy recognition and control of connected conference units. The default SSID is 00. Speak Mode Select a mode to determine how microphones are activated for participants. Max Speakers Change the maximum number of delegates and the total speakers. Total speakers includes the number of chairmen. 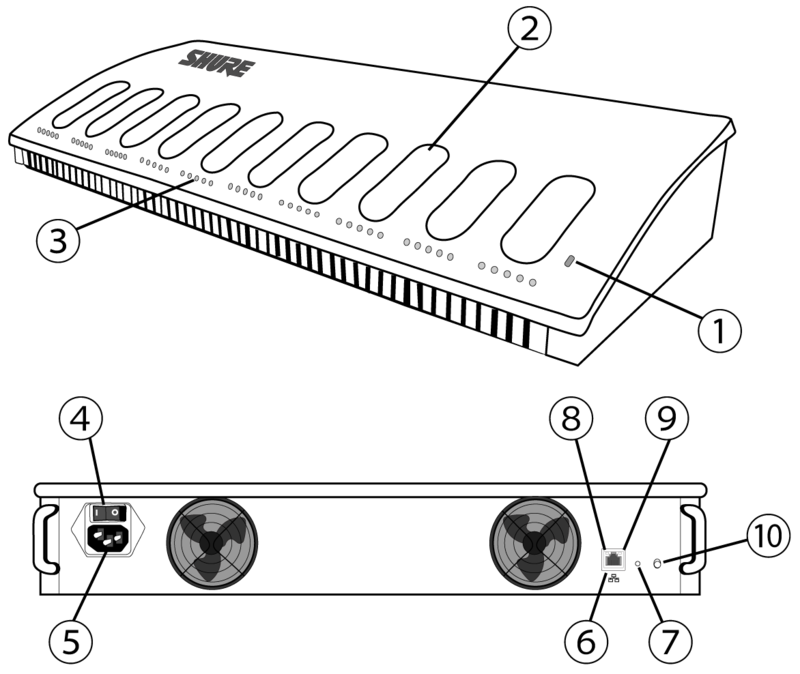 Device Connections Determine the access of additional conference units connecting and registering to the network audio. Device Control Reboot or power off all connected devices. Loudspeaker Gain Adjust the loudspeaker gain from a range of -30 dB to 6 dB, or select enter to mute. Analog In Gain Adjust the input gain from a range of -30 dB to 10 dB, or select enter to mute. Analog In Level Select line or aux level. Analog Out Gain Adjust the output gain from a range of -30 dB to 10 dB, or select enter to mute. Network Shure Control displays the IP address, Subnet, Gateway, and MAC address of the access point, while Audio Network shows this information for Dante. Set the IP address for each network interface to automatic for an assigned IP address, or manual to edit the IP address. Firmware Display the access point firmware version and serial number. Reboot The unit performs a power cycle. RF Power Select the RF coverage level of the access point, or turn it off. MXCW conference units facilitate communication between participants in group meetings and conferences. The multifunctional units enable participants to speak and be heard with clarity, even in large multilingual events, by combining a gooseneck microphone, loudspeaker, headphone jack, and user controls. 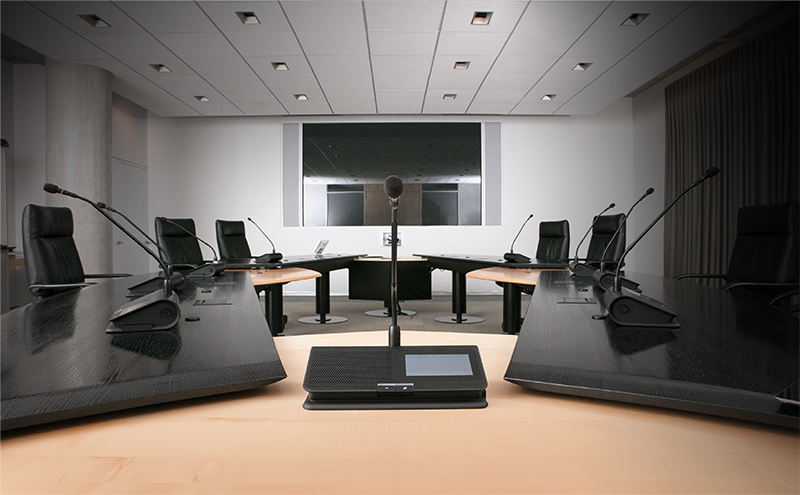 For advanced meeting tasks, MXCW microphone units include features for voting, following along to the agenda, managing speakers, and more. Provides a clear audio signal of the floor mix. Lockable 10-pin XLR connector for MXC gooseneck microphones. Two TRRS 3.5 mm ports on each side of the unit allow participants to listen to an interpretation channel or the floor audio over headphones. 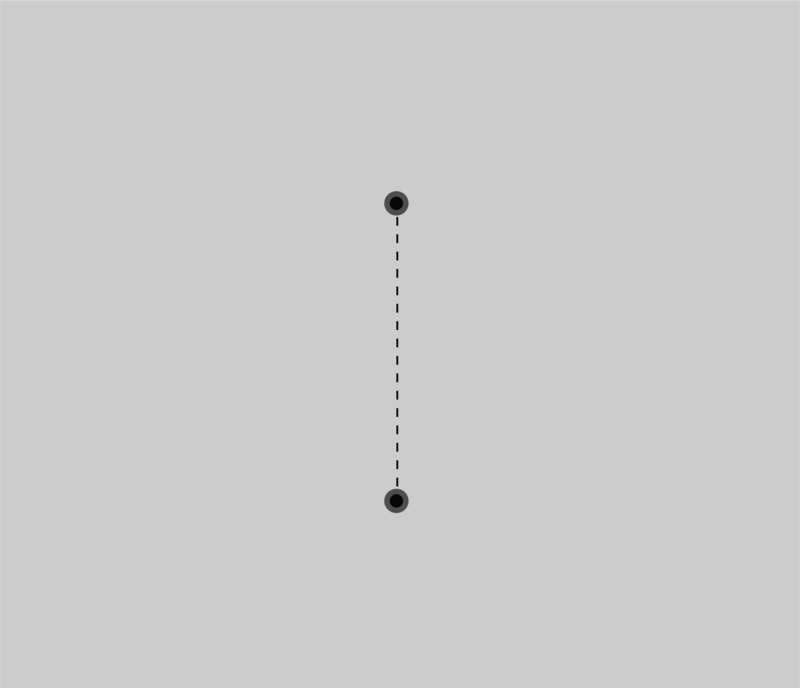 Two knobs on each side increase and decrease audio playback volume for headphones. 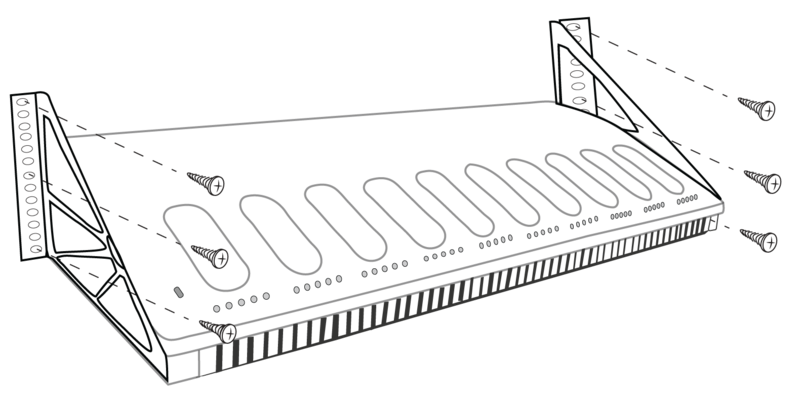 Insert a dual interface card to provide participant identification. View and select menu options on the display. Press to control the microphone. The buttons are customizable and function differently depending on the participant role and meeting setup. See Conference Unit Buttons for more details. Press and hold to power the unit on or off. The button LEDs on the front of the unit light up red when it is powered on. Press to check the remaining charge of the battery in the unit. Enables a remote caller to listen and be heard over the floor mix when a cell phone is connected. Insert an SB930 rechargeable battery to power on the unit. Connect a USB Micro-B cable to charge the battery in the conference unit. Both hardware buttons on the conference unit are customizable, and you can change the left-button functionality depending on the participant role. Access the technician menu by tapping the gear icon then tap the right side of the screen while holding down the volume control knobs. Assign a role to the conference unit. Select the function for the left button of the conference unit. Right-Button Functionality Speak Press to activate the gooseneck microphone. Solid red: The microphone is on. 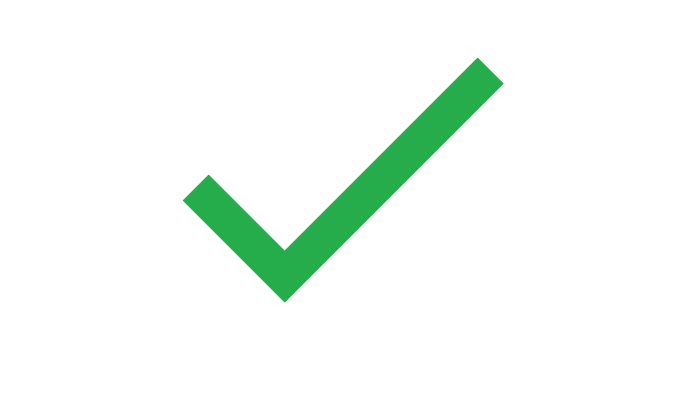 Solid green: The participant is placed in the request queue. Flashing green: The request to speak has been denied. Insert the microphone into the XLR socket. Insert the hex wrench into the hole next to the microphone on the conference unit and turn counterclockwise. The SB930 is a smart, lithium-ion rechargeable battery that powers the MXCW640 conference unit. An integrated battery level indicator allows you to quickly check the battery status. Press the button to check the remaining charge of the battery in the unit. Shows battery state when battery status button is pressed. The MXCW networked charging station (MXCWNCS) provides charging and storage for up to ten SB930 rechargeable batteries. Installation options include mounting in a rack, to a wall, or on a table surface. For charging and storing SB930 batteries. Flip the switch to turn the unit on or off. Connect to the included power supply. 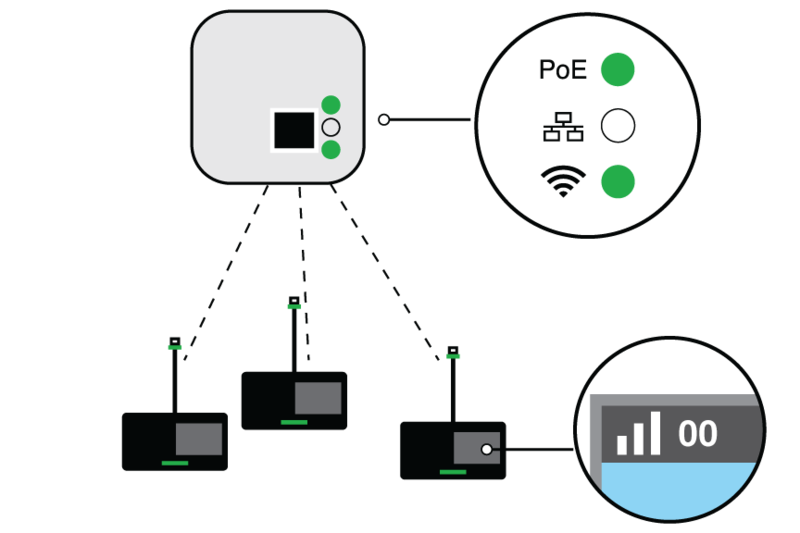 Connect to an Ethernet network to enable remote monitoring from the web application. Network reset: Press and hold for 4 seconds to reset any network settings and refresh the network connection. Factory default settings: Press and hold for 8 seconds to reset the device to factory default settings. Press to preserve battery health for batteries being stored for an extended period of time. 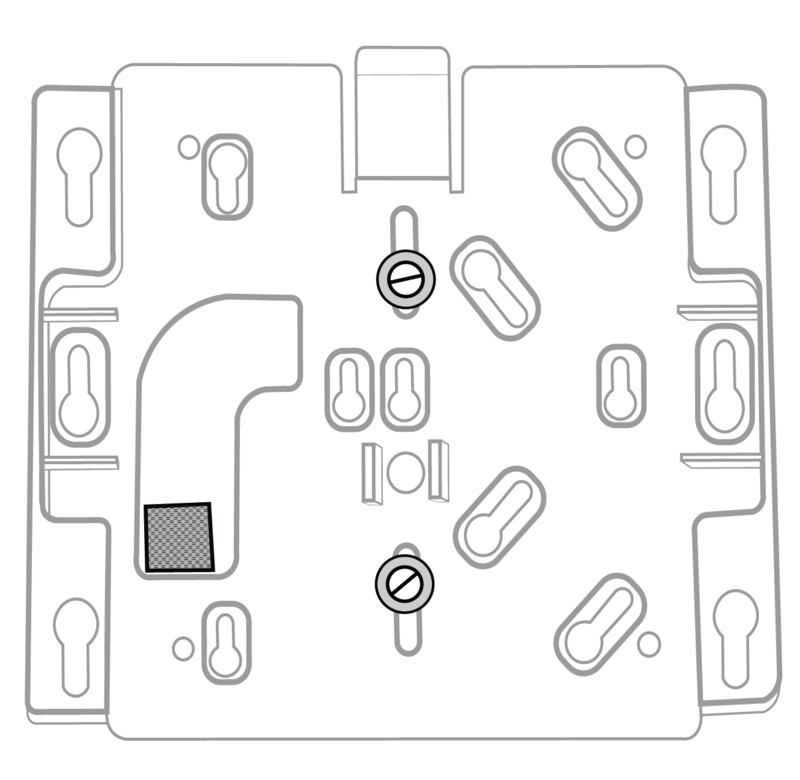 Connect the device to a power source using the supplied power cable. Flip the power switch to turn on the device. Use the MXCW charging station to store batteries for long periods of time (weeks and months). Storage mode protects batteries by storing them at a safe charge level that preserves battery health over time. When you are ready to use the batteries again, simply turn off storage mode and wait for the batteries to fully charge. Insert batteries in the charging station. From the hardware: Press and hold the Storage mode button for 5 seconds. From the software: Open the charger web application to the home page and turn on storage mode. 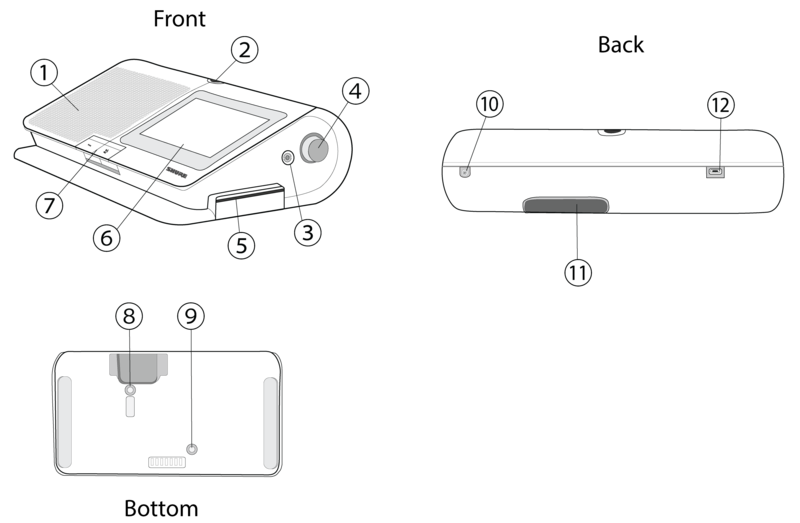 Each charging slot has a row of LEDs that illuminate to indicate the status of the battery. See the networked charging station web application for more details. Battery warm. See web application for details. The MXCW power management system combines intelligent, rechargeable technology with a variety of monitoring options for the SB930 batteries. View remaining battery runtime on in-use microphones from the touchscreen or under the Devicestab in the MXCW system web application. The remaining time is displayed in hours:minutes. Check the battery LEDs by pressing the battery status button on the bottom of the conference unit. View the charging status from the charging station web application. Monitor the LEDs on the charger. Displays the order of the batteries based on which slot they are placed in. Displays charge as a percentage of the total battery capacity. Also shows time remaining to full charge. Displays health of selected battery as a percentage of the charge capacity of a new battery. Charge capacity (battery life when fully charged) will decline as a result of repeated charge cycles, age, or storage conditions. Displays total number of times that the battery has undergone one full count of discharge and charge. Recharging after discharging halfway counts as one half of a cycle. Recharging after discharging a quarter of the way counts as one quarter of a cycle. 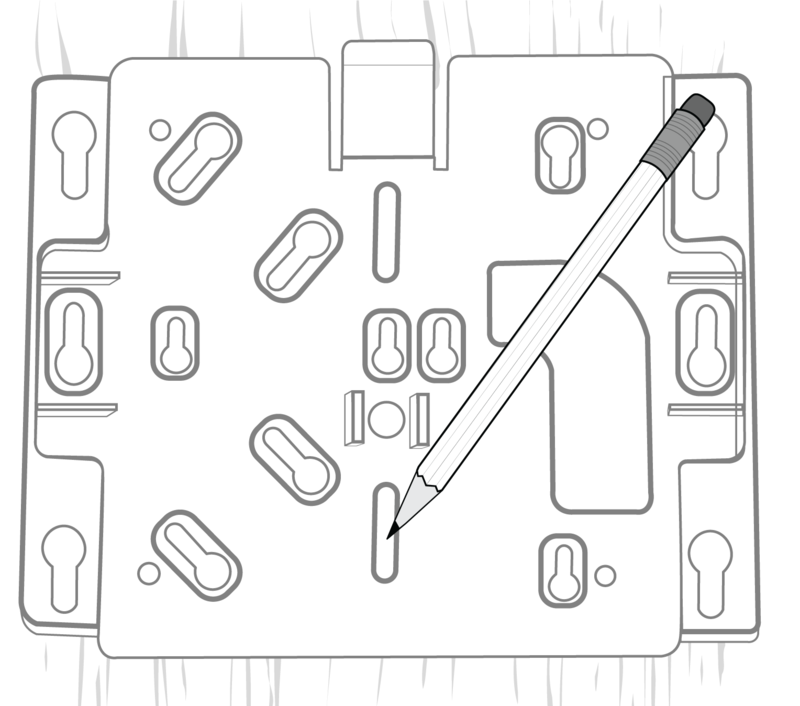 Use the USB port on the conference unit to charge the battery during operation. This can be especially useful for long meetings or when backup batteries are not available. The battery status appears as a lightning bolt on the touchscreen when plugged into USB. When a battery is being charged while the unit is turned off, the charging status shows on the touchscreen. If the battery is fully charged, the conference unit powers off after 10 minutes. Use a micro USB cable that can supply at least 2 amps of power to the conference unit. 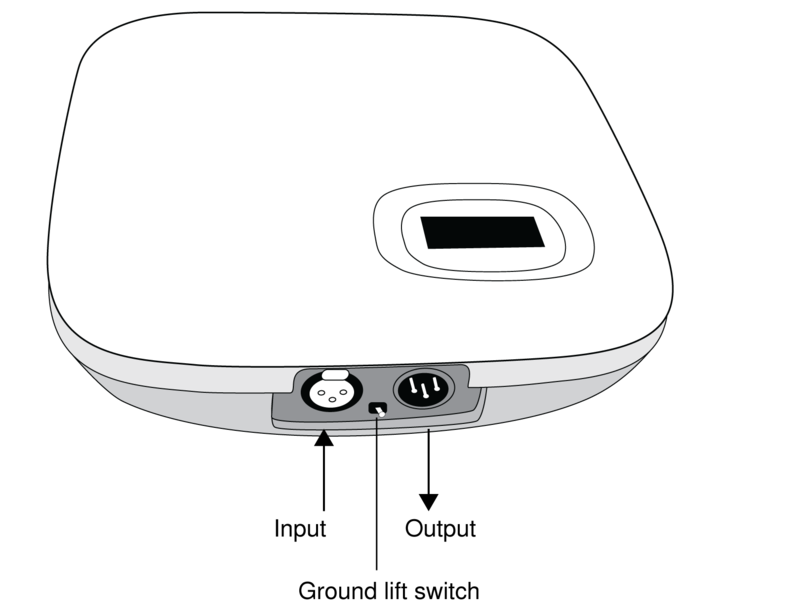 If an insufficient power supply is plugged in while the conference unit is powered on, the battery status alternates between the status and a warning symbol. If the unit is powered off, the touchscreen shows it is not charging due to an insufficient power supply. The conference unit powers off again after 10 minutes. Network Cables Use shielded Cat5e (or higher) Ethernet cables, limiting cable runs to 100 meters maximum between network devices. Audio Cables Balanced XLR cables to use analog input/output from the access point. If the router features Energy Efficient Ethernet (or Green Ethernet), ensure it is disabled from the ports dedicated for the MXCW system. Recommended: A managed switch to provide detailed information about the operation of each network link: port speed, error counters, bandwidth used, etc. Use shielded Cat 5e or higher Ethernet cables. Use Gigabit networking equipment between network audio devices. Limiting cable runs to ≤100 m between devices. Ensure MXCW components and the PC are on the same network and set to the same subnet. Tip:*Keep the system upgraded to the latest available firmware version to ensure proper system compatibility and take advantage of new features. See Firmware Updates for more information. 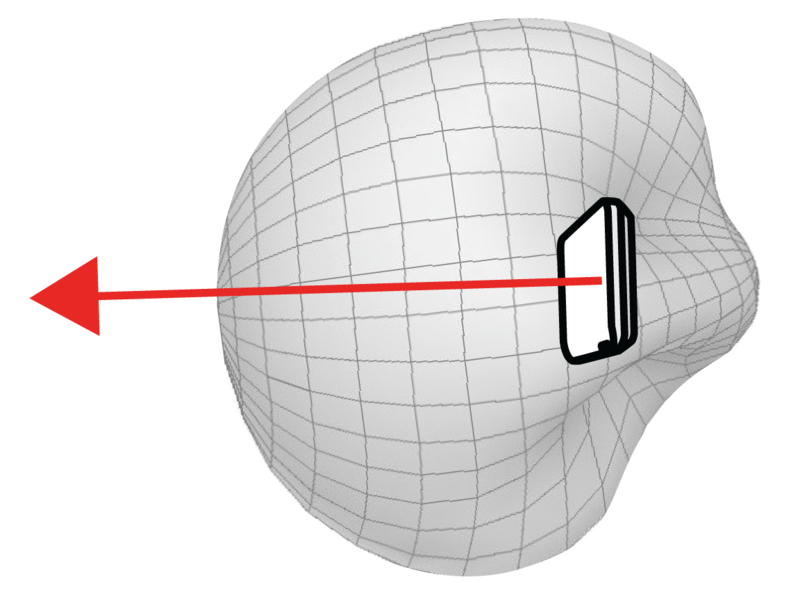 The directional antennas of the access point send and receive the RF signal in a cardioid pattern with the greatest sensitivity toward the face of the device. Always aim this side toward the microphone coverage area. 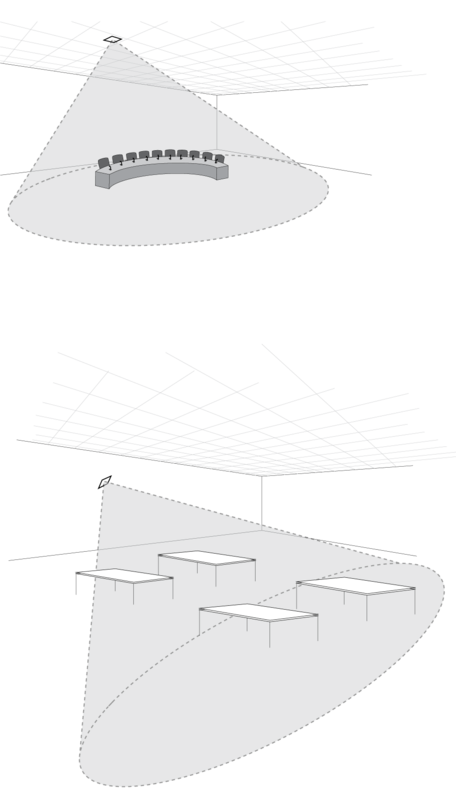 The access point is typically mounted to a ceiling or wall near the microphone coverage area. Direct the face of the access point toward the intended microphone coverage area. Position the access point so there is nothing obstructing a line of sight to the microphones. Keep the device away from large metal objects. Keep at least eight feet between access points. Mount with the reset button accessible, as it may be useful for troubleshooting. Important: Always perform a "walk around" test to verify coverage before using a wireless system during a speech or performance. Experiment with placement to find the optimum location. If necessary, mark "trouble spots" and ask presenters or performers to avoid those areas. The access point is supplied with an external cover that can be painted to match the decor of the installation. After it has been painted and dried, it snaps onto the front plate of the device. Use the mounting plate as a template and mark the location for the holes. Drill the holes into the mounting surface. Secure mounting plate to the surface. Connect of the Ethernet cable to the access point using the cable route path. Position the access point over the keyway slots of the mounting plate and slide it down into the locked position. Feed the Ethernet cable through the electrical box. Mount the bracket to the electrical box using #6-32 screws (not included). 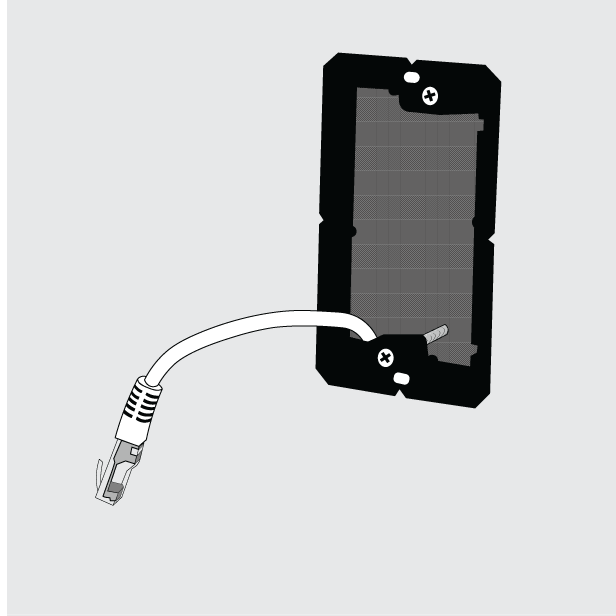 Connect the Ethernet cable to the MXCWAPT and mount the MXCWAPT to the bracket. Hold the bracket up to the wall and mark the location for the screws. Drill holes and install drywall anchors into the drywall. Mount the bracket to the drywall anchors using #8 screws (not included). Connect the Ethernet cable to the MXCWAPT and mount the MXCWAPT to the bracket. 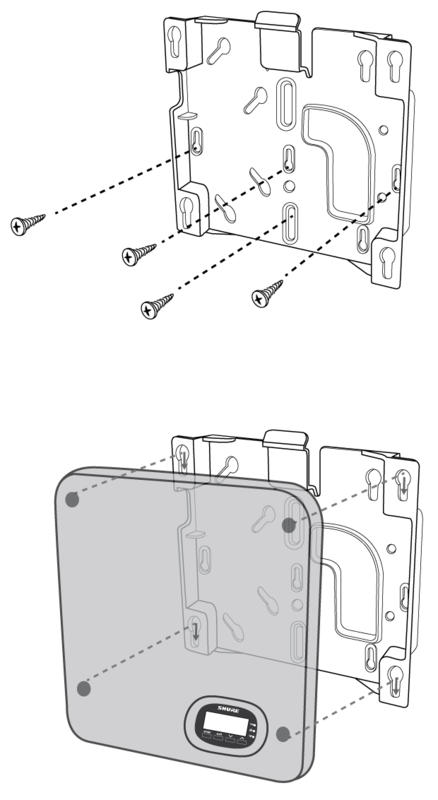 Using the channels in the back of the MXCWAPT, the Ethernet cable can be routed out the top or bottom. Hold the bracket up to the wall and mark the location of the screws. Mount the bracket to the wall using #8 screws (not included). Important: Make certain to use large fender washers or a large metal plate on the back side of the ceiling tile to support the weight of the access point. 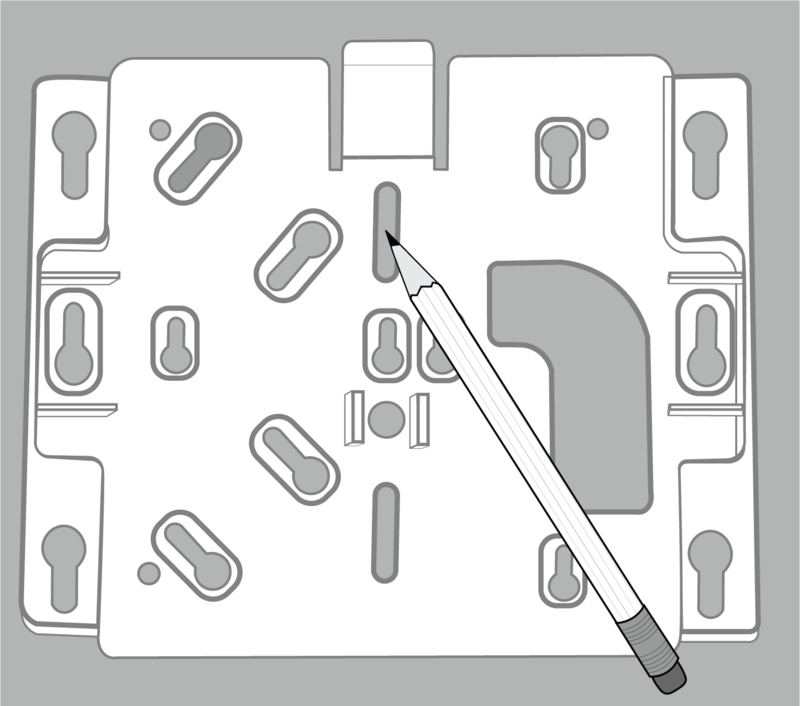 Use the mounting bracket to mark the location of two screw holes and the cable entrance on the ceiling tile. Drill two small holes for #6 screws into the ceiling tile to attach the mounting bracket. Drill or cut a larger opening for the cable. Attach the mounting bracket to the ceiling tile. Back side of ceiling tile with fender washers or metal plate. Use lock nuts or blue Locktite on standard nuts to make certain the nuts do not loosen with any vibration. Run the cable through the hole, attach it to the APT and attach the APT to the mounting bracket. 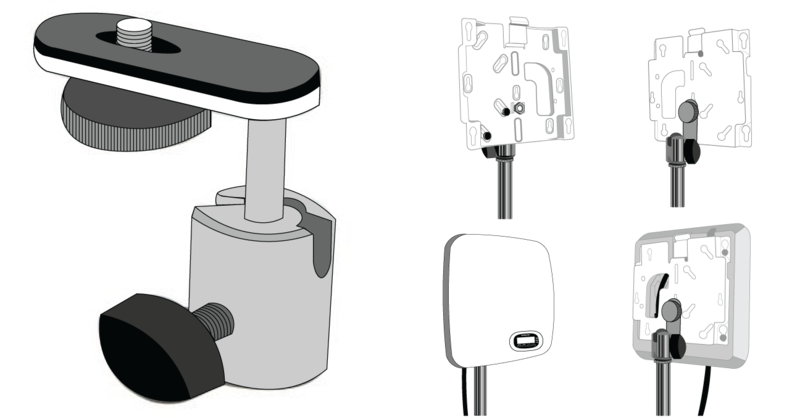 On-Stage offers adapters to bolt the mounting plate to a mic stand or tripod. The CM01 and UM01 both use a 1/4-20 bolt on them. Purchase a 1/4-20 nut from a local hardware store. The screws for attaching the mounting brackets to the charger are provided. Screws for securing the charger to another surface must be purchased at a hardware store. Important: The top of the screw must extend exactly 9/64 (0.149) inches (3.78 mm) above the surface (about 4 ½ threads). Use the screws that best fit the thickness of the surface. Use at least 3 screws to secure the mounting brackets to the charger. Use at least 3 screws on each side to secure the mounting brackets to the rack or wall. Screw the mounting brackets to each side of the charging station. Leave room for cabling to the charging station. 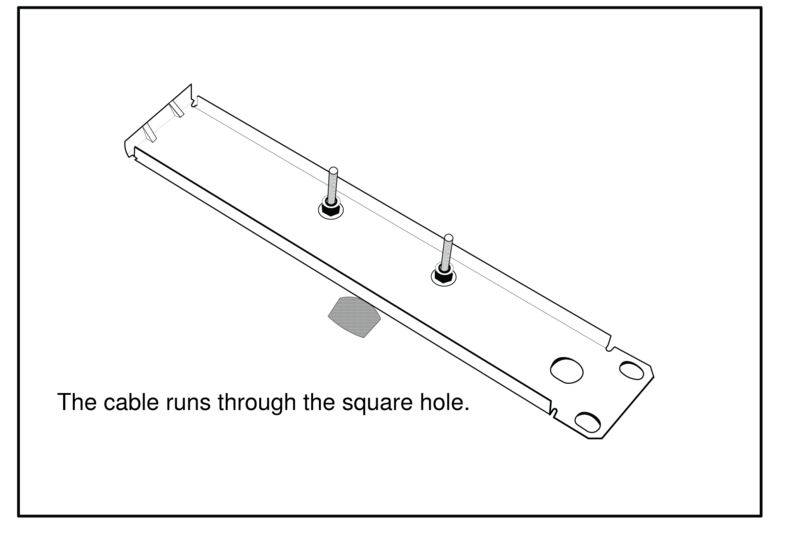 Attach the mounting bracket to the rack or wall using the appropriate screws for you surface. Note: Use 3 screws on each side of the mounting bracket when installing the charger. Ambient temperature of the rack should not exceed specified operating temperature range of the device. Keep fan inlet and air vents clear from obstruction and provide adequate space for airflow within the rack. 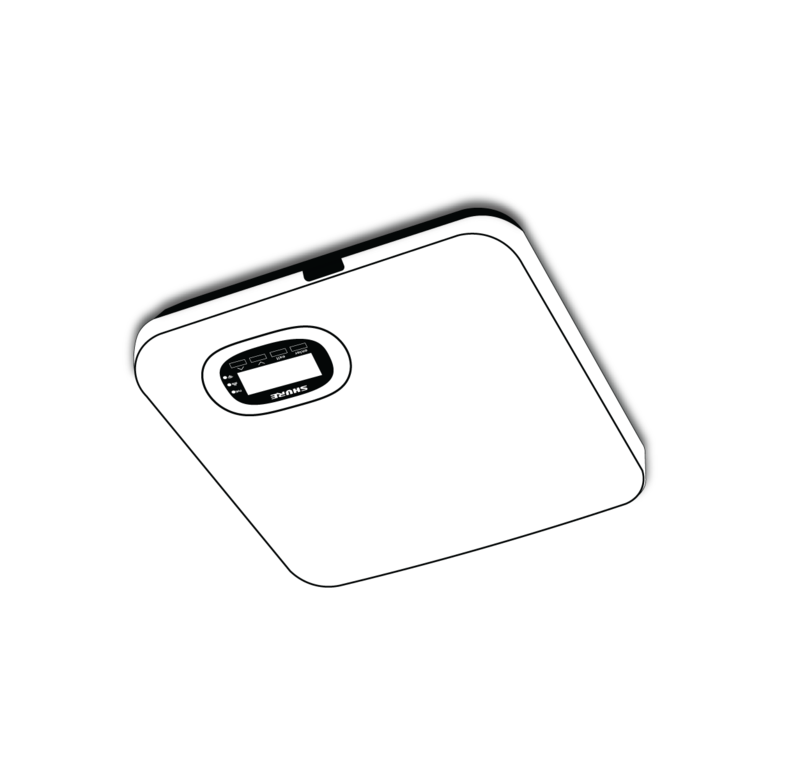 When possible, provide 1 RU of empty space between each device. Connect up to 125 MXCW wireless conference units to a single access point. 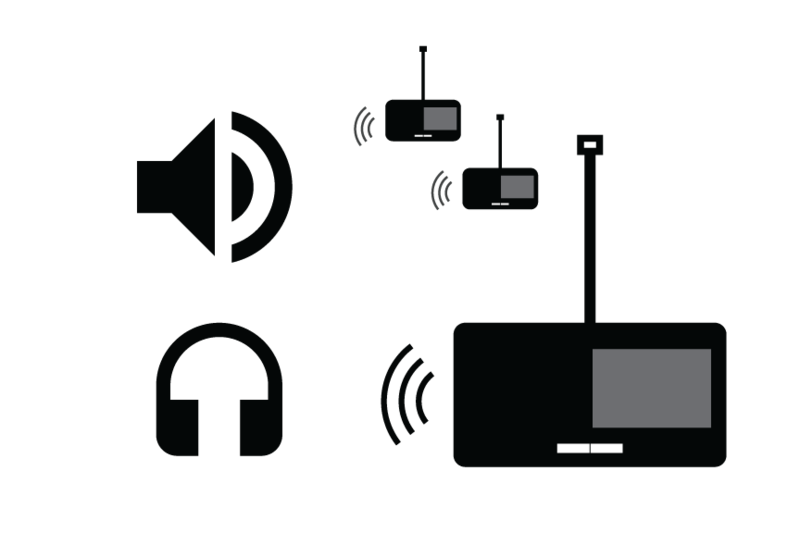 Connected devices operate as a self-contained, encrypted audio system for speaking, listening, and contributing to the meeting. Setting up wireless MXCW devices is similar to connecting your computer to a wireless network. The MXCW access point acts as the wireless router, broadcasting a network SSID to the wireless devices in range. The access point includes several customizable network SSIDs that allow you to label MXCW networks for easy recognition and control according to the installation or application. 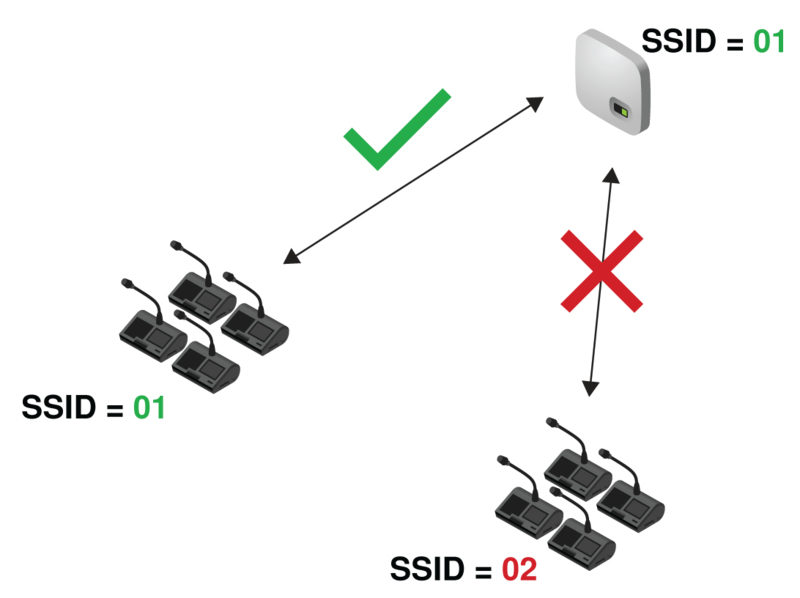 A default network (SSID 00) ensures that new or reset devices automatically connect after powering on. To add a microphone, simply connect it to the right network. 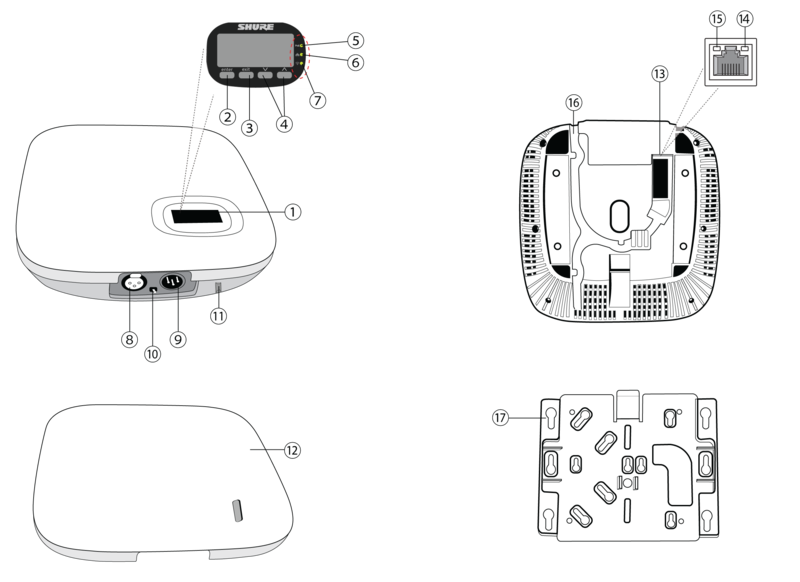 MXCW wireless devices automatically connect and register after power up. The default network SSID 00 ensures new or factory reset devices connect automatically to the access point in range. Power on the access point. Wait for it to automatically select the best available wireless channel for operation. When the channel is secured, the access point will broadcast its network (SSID 00) to the wireless MXCW devices. Power on the MXCW conference unit. 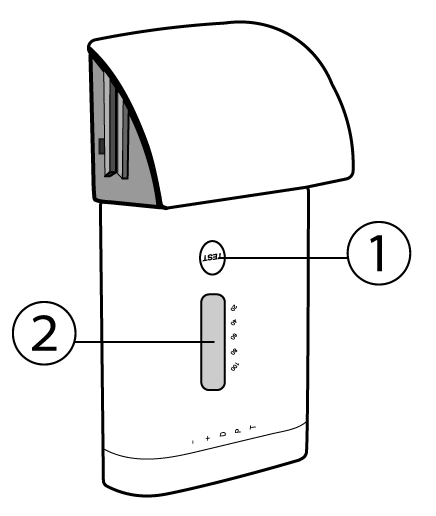 The device automatically scans for the default network. The default access point network (SSID 00) is selected and the devices are ready for use. 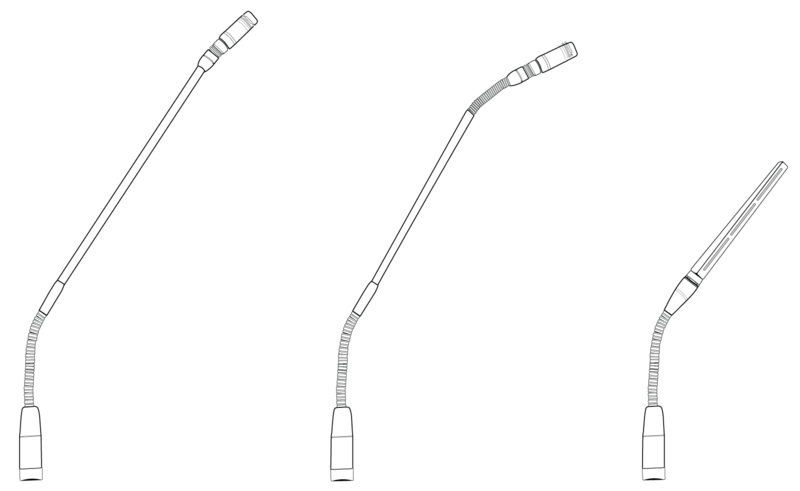 Add additional microphones until all participants are covered or the system is full. Security: Customs SSIDs are less likely to inadvertently connect unwanted wireless microphones. Automatic Updates: All connected devices automatically update to match the new network label. Go to Settings > SSIDs. Select an SSID and rename it. Choose names (up to 32 characters) that make sense for your installation or use case. Note: The default SSID 00 is not editable. (Optional) Press Push to devices to update the static SSID list on all devices connected to this access point The device startup mode must be set to static list. 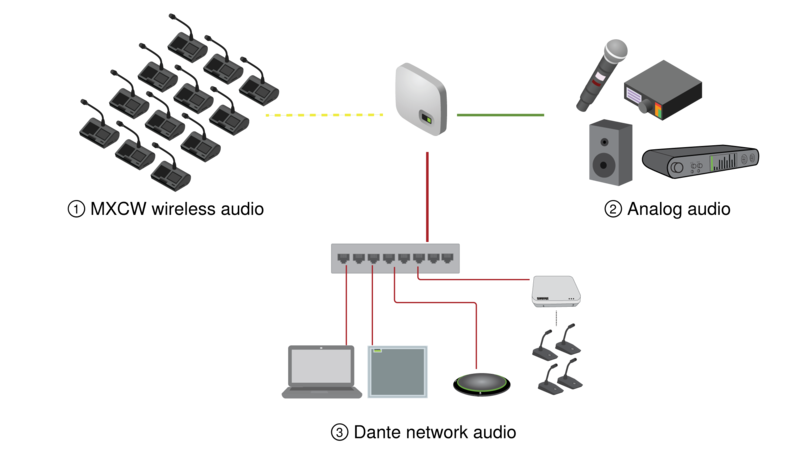 To create separate microphone systems, use multiple access points and set each one to a different SSID. Then connect the conference units to the corresponding network to set up the independent systems. 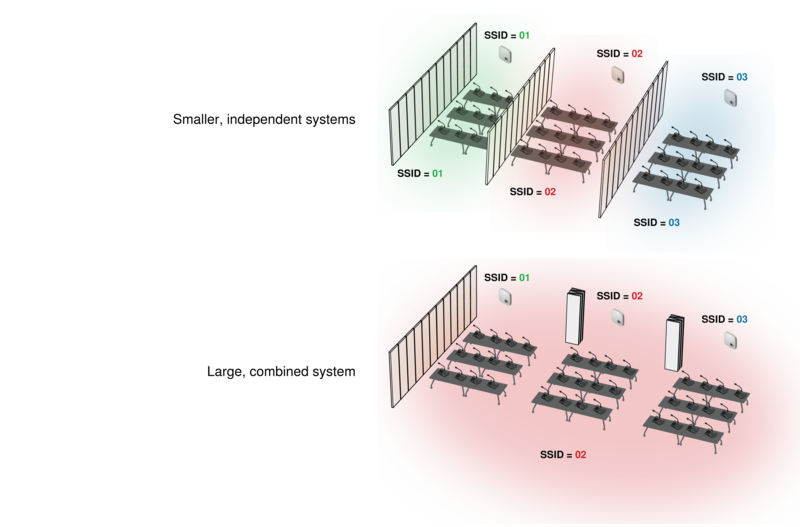 Multiple networks are useful for installations with adjacent meetings or divisible rooms that can be reconfigured depending on the size and needs of the event. Use different SSIDs to separate conference units into independent systems for smaller events. When the room opens up to support more participants, simply set all conference units to the same access point network to create a large system. Open the MXCW web application and go to Settings > SSIDs. Select that network and press Set to confirm the setting. All connected microphones automatically update to the new network. Open the technician menu on the MXCW640 by tapping the gear icon, then tap the right side of the screen while holding down the volume control knobs. Depending on the Startup mode set on the unit, either scan for a network or view options in the list. Choose an access point network and press Connect . 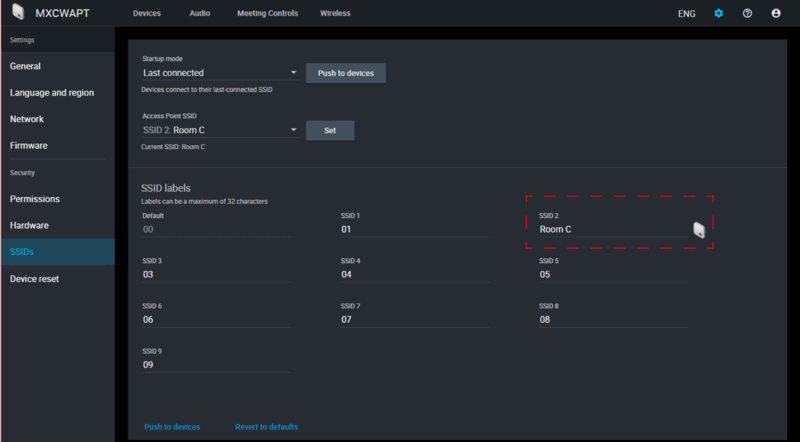 To combine rooms again, simply change the conference units back to the original network to create the larger system. The device displays the connected network from the toolbar. Set the Startup Mode to determine how MXCW conference units connect to the access point after powering on. Last Connected (default) Automatically selects the network it was last connected to before powering down. New or factory default devices use this setting to access the SSID 00 by default. List Manually choose from a prepopulated list of networks. To update the list with custom names, rename the SSID labels in the web application and push the list to the registered wireless devices. Scan The device scans for available access point networks and ranks them with strongest signal at top, and weakest at the bottom. Manually select the network from the list. Tip: When choosing the network manually, the list indicates the last connected access point with a star. Web applications provide convenient, remote access to configure, monitor, and control the system. The application is hosted in the device on an embedded webserver and can be accessed using the device IP address or DNS name. MXCW system and meeting control Access point (MXCWAPT) Full configuration and control of the MXCW system, devices, participants, and live meetings. Charging batteries Charging station (MXCWNCS) Monitor battery charge and statistics. Connect the computer to the device network. 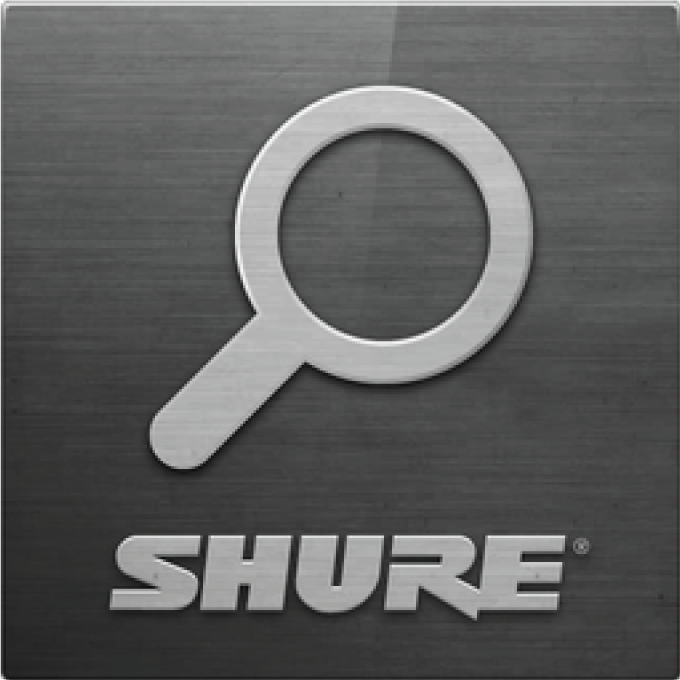 Open the Shure Web Device Discovery application. 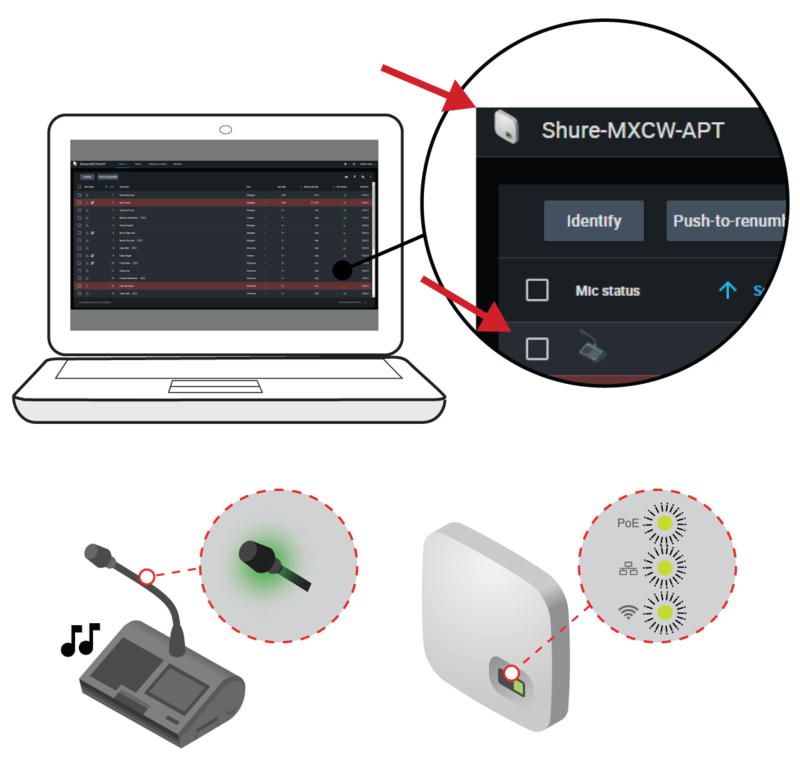 The application lists Shure devices on the network that provide computer control. Double-click the row or right-click to copy the IP address or DNS name to paste into a browser. You can bypass the Web Device Discovery application by entering the device DNS name into an internet browser. The DNS name is derived from the model of the unit (MXCWAPT or MXCWNCS), in combination with the last three bytes (six digits) of the MAC address, and ending in .local. Admin view for meeting setup and configuration (default page). This view has full access to all other views. Chairman view for the chairman/operator. Signing into this view allows access to the Display view as well. Display view for meeting participants. Signing into this view does not allow access to other views. Open the web application and sign in to the desired view. To have access to all views, sign in as the administrator and select one of the additional views from the user dropdown. This view is dedicated for setting up and controlling meetings. 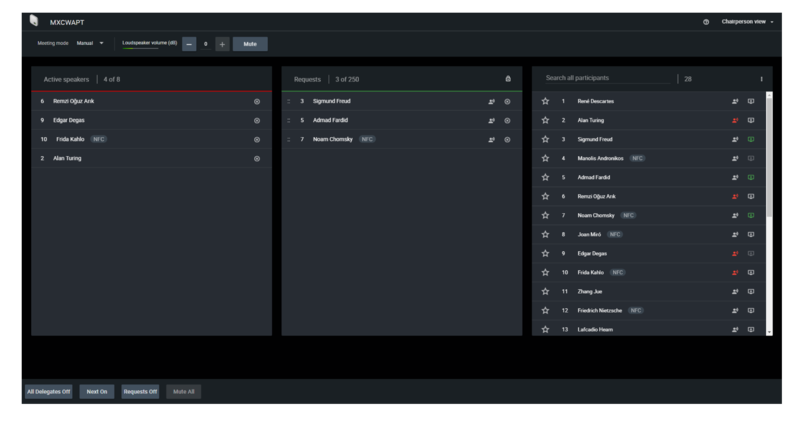 Use this view to manage Devices, Audio, Meeting Controls, and Wireless settings. This view is dedicated for microphone control during the meeting. Use this view to manage speakers and speak requests. See Managing Speakers from the Web Application for more information. This view shows the speaker and request lists to meeting participants. Use this view to share a screen with the entire meeting space. Anyone can access these views from a computer or mobile device connected to the network. To control access with a password, while in Admin view open the Settings menu and select the Permissions tab to create or edit passwords. Microflex Complete Wireless provides automatic, encrypted wireless transmission for up to 125 conference units at a time. The access point scans and selects the best operating channel across the Wi-Fi 2.4 GHz and 5 GHz frequency bands, including DFS channels. The RF power level determines the operating distance between the access point and conference units. Set the RF power level according to the size of the microphone installation. Select the RF power from the web application by going to Wireless > RF power. Note: Maximum transmitter power varies by region. 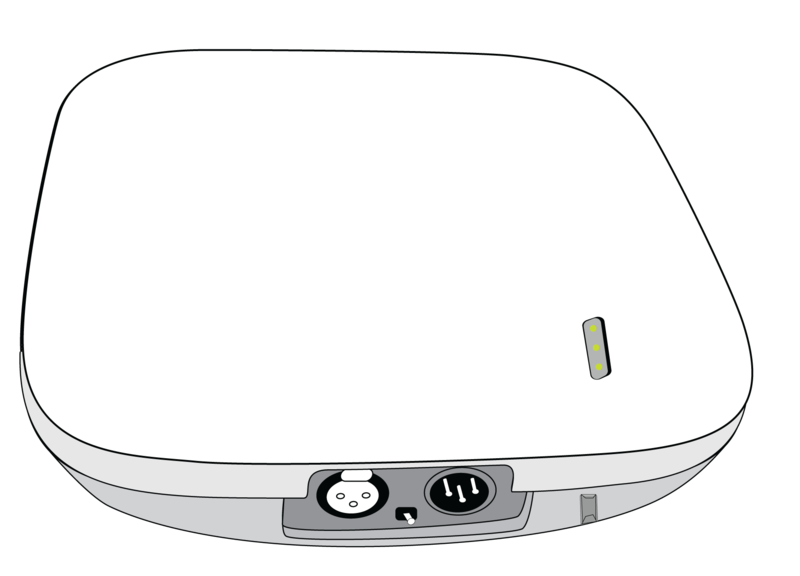 The access point RF pattern is cardioid, picking up equally from the sides to the front cover of the unit. Increase RF power levels to cover larger combined rooms. MXCW easily scales from 2 to 125 microphone units without any change in the audio performance. The bandwidth is strategically divided, allocating the uplink channels only for active speakers, while preserving traffic for continuous downlink monitoring channels. You can avoid specific wireless channels by deselecting them from the web application. The MXCW system scans all channels in the 2.4 and 5 GHz spectrum and chooses the cleanest one for operation. After deselecting specific channels, MXCW will no longer scan and operate in those frequencies. At least one non-DFS channel must be selected at all times. Press Select wireless channels . 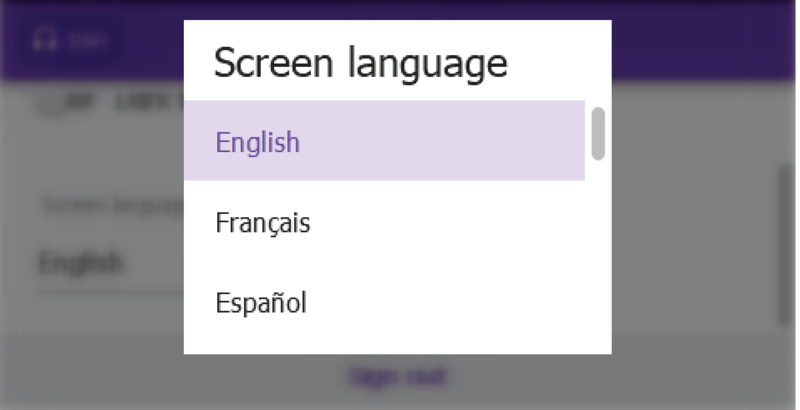 Deselect the channels you do not want to use. Press Apply to save your changes. The access point has a built-in spectrum analyzer that continuously scans the Wi-Fi environment and ranks the best channels for operation. 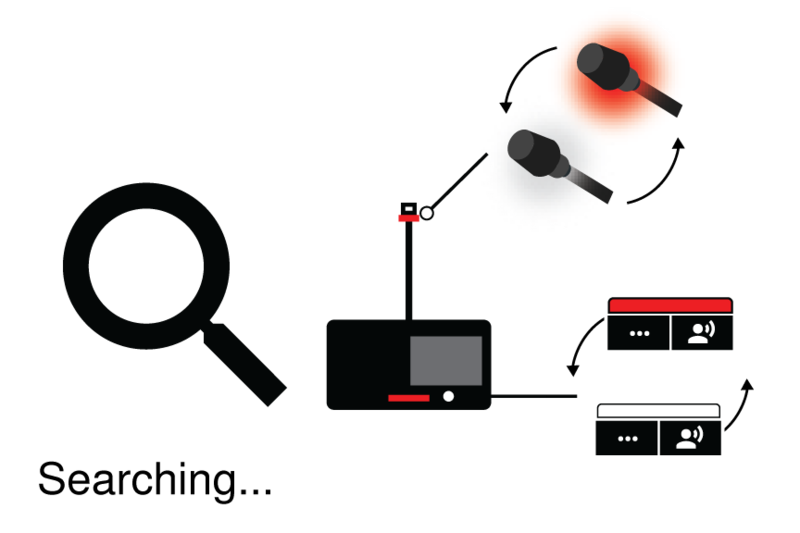 If interference is detected, the access point changes to a verified backup channel with minimal disruption to the audio performance. MXCW commonly operates in a specific block of 5 GHz channels that require Dynamic Frequency Selection (DFS) or Doppler weather radar Dynamic Frequency Selection (DDFS). These channels reserve priority for weather, aviation, and military devices. To avoid interference with priority devices, the access point has a built-in spectrum analyzer that continuously scans the wireless environment and ranks the best channels for operation. If interference is detected it will vacate the channel temporarily and change to a verified backup channel with minimal disruption to the audio performance. The channel turns grey in the web application to indicate it is unavailable. When the channel becomes available, the system will resume scanning and verifying the channel for use. Ensure a clear line of sight between access point and the conference units. Make sure people do not block the line of sight between receiver and transmitter. Ensure at least 3 meters (10 feet) between access point and Wi-Fi routers, computers, or other active 2.4 GHz or 5 GHz sources. Turn on typical Wi-Fi devices prior to the event so the MXCW system has time to select a clean channel. Avoid heavy Wi-Fi traffic activities on nearby networks such as downloading large files or viewing a movie. During sound check, mark trouble spots and position participants away from those areas. 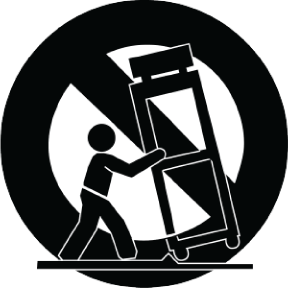 Move access point and microphones away from metal or other dense materials. For the global MXCWAPT-W variation, set the operating region for the most reliable scans and to comply with local regulations. This is only required for the global MXCWAPT-W model variation. Speaker limits: The chairman can speak at any time, while delegates may need to wait their turn. Speak priority: Participants can interrupt another active speaker depending on rank. Hardware controls: Microphone button options depend on the role of the speaker. For example, since the chairman is responsible for the meeting, additional controls and permissions are granted to perform additional tasks and to speak at any time without waiting in line. Others are listeners and have minimal speaking permissions. Chairman Moderator or leader of the event The chairman is a participant with additional permissions for controlling delegate microphones, accessing meeting controls, and overriding delegate speakers at any time. Delegate Typical participant Delegates represent the majority of participants in a meeting. Depending on the microphone operation, delegates may need to wait in the request queue until it is their turn to speak. Listener No microphone required Participants use the device only to listen to the floor mix (using the loudspeaker) or to an interpretation channel (using headphones). There are no speaking permissions in this role, but a chairman can turn on this microphone manually. Ambient Improves audio mix A spare, utility device for adding natural room ambient noise to the floor mix to aid during pauses in speech or brief breaks between agenda items when no other participants are on the speaker list. There are no listening or speaking permissions in this role. 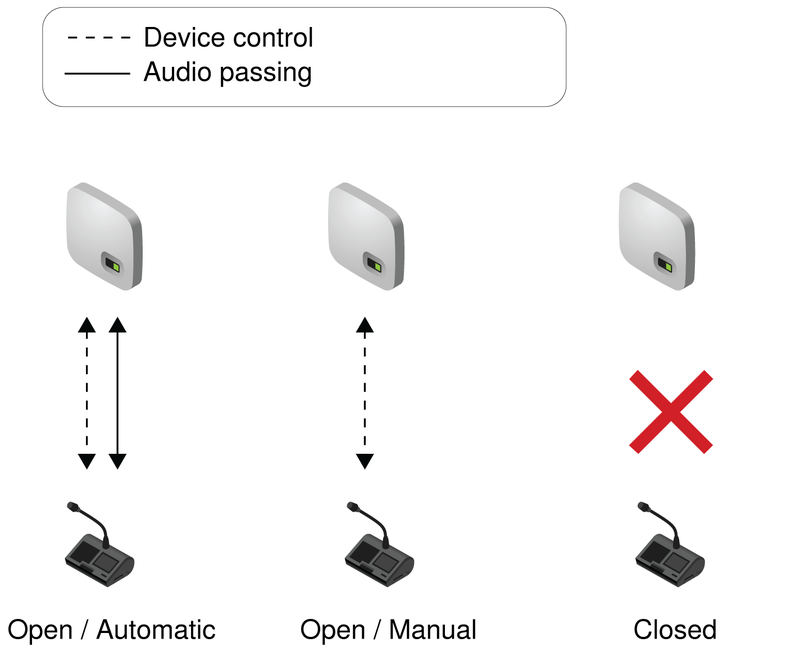 Go to Meetings Controls > Advanced > Enable ambient microphones. Find and select the participant (or seat) in the list. Select the role to expand the dropdown and view additional roles. Select the role for that participant. The device reprograms with the corresponding controls and permissions. Tip: To update multiple participants at once: select them and change the role from the side properties panel. Enter the technician menu on the conference unit. From the role tab, select a new role. Before making changes in the software, confirm you are interacting with the correct hardware. Click the desired device's icon. The device beeps or flashes to confirm your selection. wrench icon to change the device identification indicator. Select the icon again to stop identifying or wait until it times out (30 seconds). Choose which information you want to see from the Devices tab. Edit the filter and visible columns to remove fields that are not useful to your workflow. To return to default settings, open more options and select Reset. The chairman and meeting operators will need to refer to the participants by either name, seat number, or both. The proper assignment of names and seat numbers is critical to ensure the continuity of the discussion. When setting up the installation for the first time, each microphone unit appears with its default name and an automatically assigned seat number according to the order they were powered on. Use the Devices tab to match wireless devices to the anticipated seating chart. Note: Devices already display the participant's name if an NFC card is inserted. See NFC Card Functionality for more details. 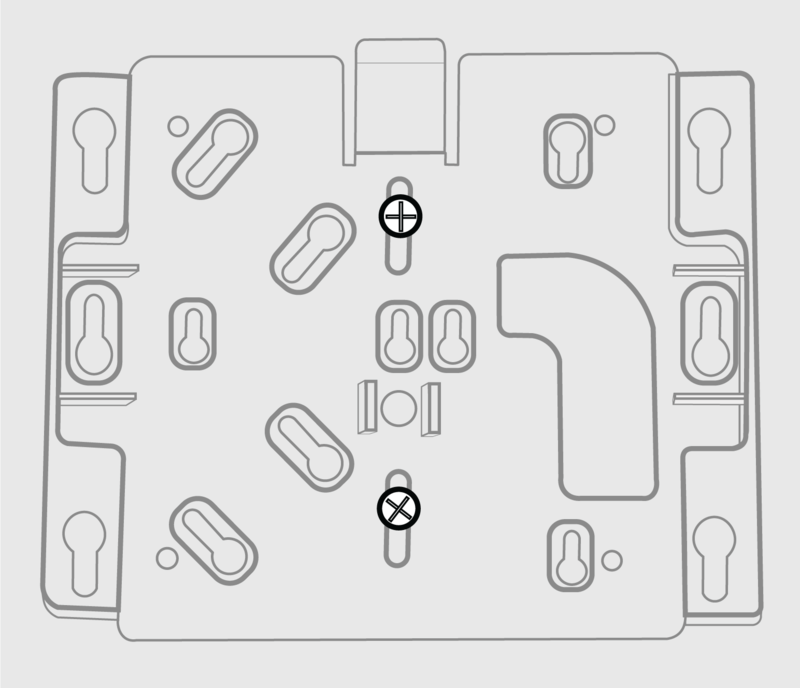 Draw a seating chart, or diagram, that represents the room. Number each seat that requires a microphone. Add participant names to the seating chart. Provide seat names by clicking the seat name field and writing the new name for each unit. To move a single seat, click in the Seat field for that row and enter the new number. If another seat already exists in that number, it will simply swap (exchange) positions with the other seat. To move multiple seats, click Push-to-renumber. Enable this mode to rearrange seats by pressing each device's Speak buttons in the preferred order. This will remap devices according to the order the buttons are pressed. Use the free Shure NFC Card Programming application (available on www.shure.com) to program NFC identification cards with the names of meeting participants. The NFC Card Programming application is designed to work with ACOS3 dual interface or contactless cards, such as the MXCDualCard. 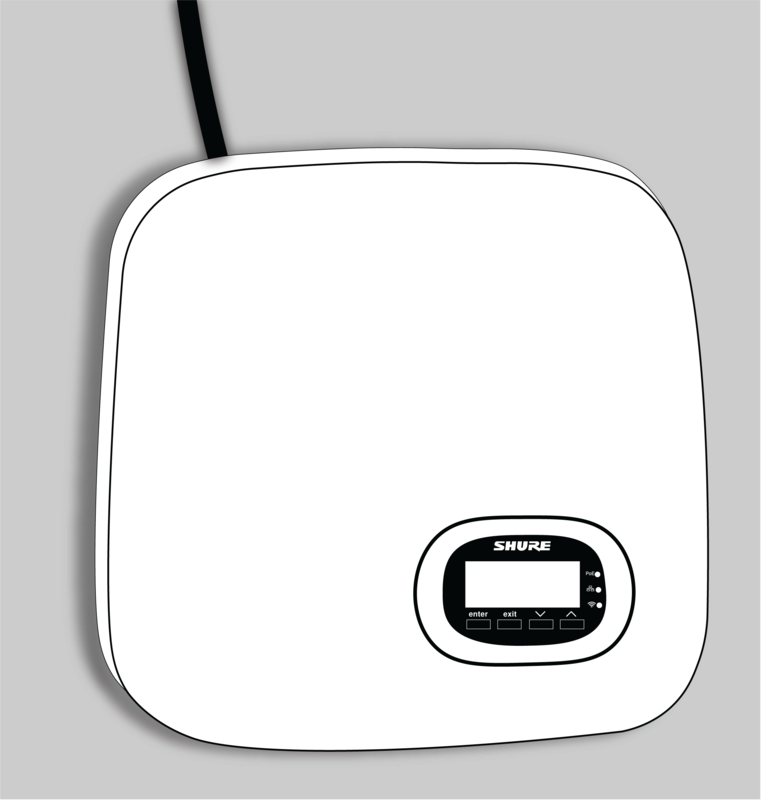 Use the ACR1252U USB card programmer (www.acs.com.hk) to write participant names to the identification cards. Go to Meeting Controls > Advanced > Enable NFC. Insert an NFC card into the conference unit so participants are identified by their name. When speaker interruption is enabled, participants can override each other in the speaker list based on their speak priority and their role. Manually adjust the speak priority of each participant to meet the needs of your meeting. Open the web application to the Devices tab. Select the participant in the table to open the properties panel. Expand the additional properties and adjust the speak priority for that participant. When interruption is allowed, a participant that turns on their microphone will override the last person in the speaker list. The different modes determine the behavior of microphone activation when the speaker list is full. See Speak Priority for information on adjusting individual participants' priority. 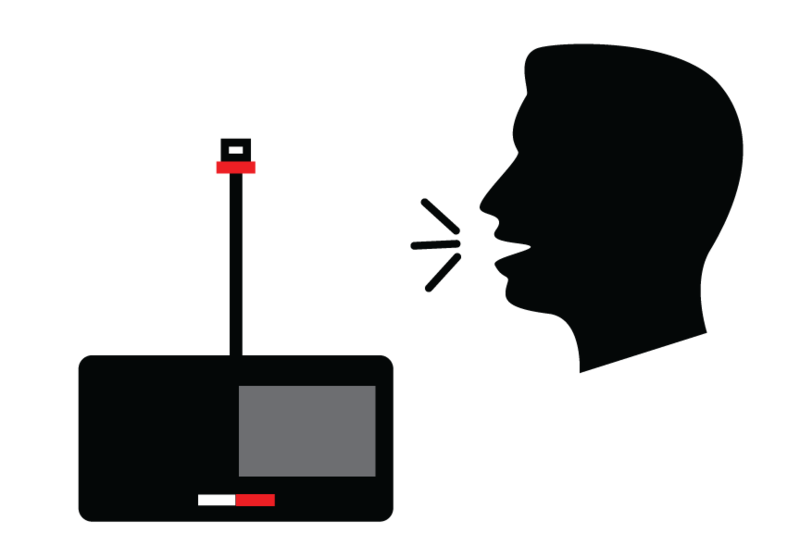 The speak mode determines the way the participants use their microphones in a group setting. Several factors may affect the meeting requirements and the manner in which the meeting is run: room size, number of participants, formality of the event, and amount of technical support on staff. The speak mode addresses these factors with presets to control the microphone behavior. Automatic (default) Press to speak Speak button turns on participant microphone. There is no request queue: when the speaker list is full, the mic does not turn on. FIFO (First in, first out) Automatic request queue Speak button adds participant to a queue system. Once the speaker list is full, participants are placed into a chronological request queue. The next microphone in queue turns on automatically once a space is open in the speaker list. Manual Managed request queue Speak button adds the participant to a request queue that is managed by the chairman or operator. Note: Speak priority may affect the list. A new speaker with higher priority may automatically override the earliest activated microphone if that speaker has a lower priority. See Speak Priority for more details. The speak mode is a system setting that applies to all conference units registered with the access point. The MXCW system allows up to 8 active speakers. Once the speaker list is full, participants must wait until their turn to speak. If they attempt to speak before their turn, their microphone LED ring flashes momentarily and then turns off as a reminder. Go to Meeting Controls > Basic. Use the plus sign (+) and minus sign (−) to change the number of speakers. Total: Total number of active delegate and chairman devices. This is the absolute maximum number of people that can address the floor at the same time. Delegate: Number of delegate microphones that can be open at the same time (excludes the chairman). Maximum Requests: Total number of participants that can be in the request queue. This is only available in Manual and FIFO mode. Add an extra participant to the total number of speakers to allow a chairman to speak at any time. When using First In, First Out (FIFO) mode, set the maximum number of speakers to 1 so the participants must wait to speak until another has finished. Go to Meeting Controls > Advanced > Microphone off permissions. Select Only admin/chairman can turn off participant microphones. Select Prevent double-press of Speak button. Set the amount of time (in seconds) for a conference unit to register a second press. Optional: Allow a delegate to cancel the administrator or chairman's speak button press by holding the speak button down for an assigned duration between 1 - 120 seconds. Click on a participant name to turn on the microphone, or add them to the request queue. Active speakers List (Red) The speaker list displays the name and seat number of each active microphone. The list displays in chronological order, with the most recently activated microphone at the top of the list. Requests (Green) Delegates in this list are next up for speaking. 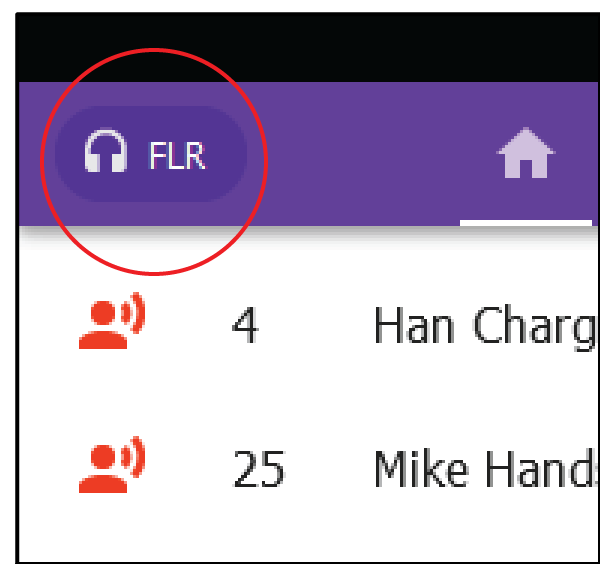 Primarily useful when operating in First In First Out mode (FIFO), the queue chronologically lists all participants that have pressed their speak button. Once an opening is available in the speak list, the participant at the top of the queue list is automatically turned on. All participants This is a full list of meeting participants. Change seat names, sort the participant list, and move delegates to the Active speakers or Requests lists. Speak Instantly turns on a participant’s microphone. Select the icon next to the participant name to add them to the Speak list. Request Add a participant to the request queue to put them in line for speaking. Select from any participant in the system, excluding the chairman. All Delegates Off Turns off all participant units, leaving only the chairman in the speaker list. Next On Activates the participant microphone at the top of the request queue. If the maximum speaker count has been reached, the new speaker replaces the last one on the list. All Requests Off Removes all participants from the request queue. Mute All Turns all participant microphones to mute without affecting the speaker list. 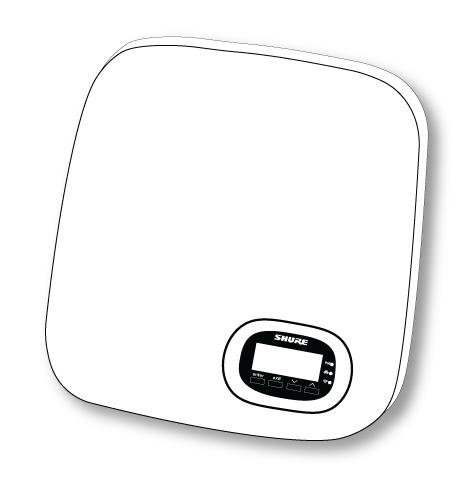 Once the unit has powered on, tap the LCD touchscreen to access the Home screen. Log in using a code or an NFC chip card if prompted. The Home screen displays a combined speaker and request list. Access the Settings menu by tapping on the gear icon in the navigation pane. From this screen you can hide the status bar, change the screen to a dark theme, and change the screen language. Tap the gear icon to enter settings menu. Hold down on both volume control knobs and tap on the right side of the touchscreen. The MXCW system supports wireless, analog, and Dante™ network channels for a wide range of applications and installations. Use the web application to customize the audio system for your meeting. Send the floor mix to multiple outputs for recording, broadcasting, and a spillover listening room. Add an external sound source to the floor mix, such as a bodypack microphone for presenters. Record each active microphone on a separate audio channel for official record keeping. Reference the table for a variety of MXCW routing options. Speaking Channels (Uplink) 8 uplink channels are provided for active microphones. As participants turn on their microphones, they are added to these channels.Depending on your event, you may want to lower the limit on speakers or add chairman role to certain participants. See Setting the Number of Active Speakers for more information. Whenever a microphone is turned on, the audio is routed to the floor mix by default. The floor mix combines all active speakers and sends that signal to the other participant units for listening. Listen to the floor mix on the unit loudspeaker or the headphone channel. 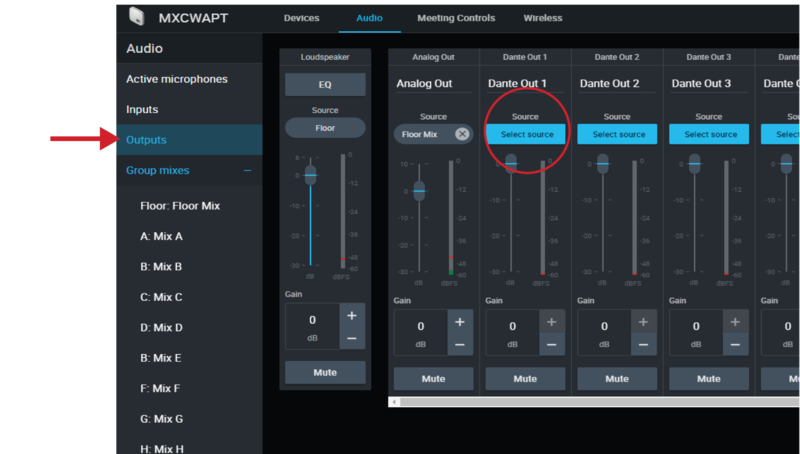 Use the MXCW system web application to monitor and adjust the microphone slots for audio contributing to the floor mix. Go to Audio > Active microphones. Easily connect additional equipment using the XLR analog connectors on the MXCW access point. Common applications include adding a Q&A or presenter microphone, sending audio out to a broadcast feed, or connecting to a teleconferencing system. Use the equalization filters to reduce unwanted sounds like HVAC. Automatic gain control adjusts channel levels to ensure consistent volume for all speakers, in all scenarios. For quieter voices, it increases gain; for louder voices, it attenuates the signal. The automatic gain control is post-fader, and adjusts the channel level after the input level has been adjusted. Enable it on channels where the distance between the speaker and the microphone may vary, or in rooms where many different people will use the conferencing system. Go to Audio > Active microphones and click on the AGC button. Select the desired devices from the Devices tab and check the Enable AGC box. Add other audio sources to blend with the floor mix of MXCW wireless microphones. Analog input: Connect an audio source to the XLR input on the access point. Tip: Flip the ground lift switch if a buzzing or humming sound occurs because of a ground loop. Digital audio: Route audio to one of the MXCW Dante channels using Dante Controller software. Ensure the sources are selected on the floor group. If necessary, adjust the volume level or EQ to match the other input levels from Audio > Inputs. Tip: Always use AGC on each channel for automatic, continuous volume optimization. By default, the audio from any active microphone is routed to the floor mix. However, you can remove a conference unit from the floor mix if you do not want it to go to the loudspeakers. For example, an official's microphone unit can be recorded but kept private (taken out of the floor mix). Remove it from the floor mix and route it another group that is connected to a recording system for archival purposes. Go to Audio > Group mixes > Floor. Find the seat you want to remove and deselect it. Tip: Select Show connected seats only to filter out unoccupied seats. Route the audio from that seat to another group. Open the desired group and select the seat. Select that group as the source for the output channel. Choose the group mix that the seat is routed to. This group (with the seat that was removed from the floor mix) is now routed to the output channel and ready for recording, broadcasting, or another application. Assign each participant to their own group mix to record them individually on predetermined channels. Open the first group mix (A). Select the first seat. For easy reference, rename the group according that seat. Repeat for the rest of the group mixes (B - H). 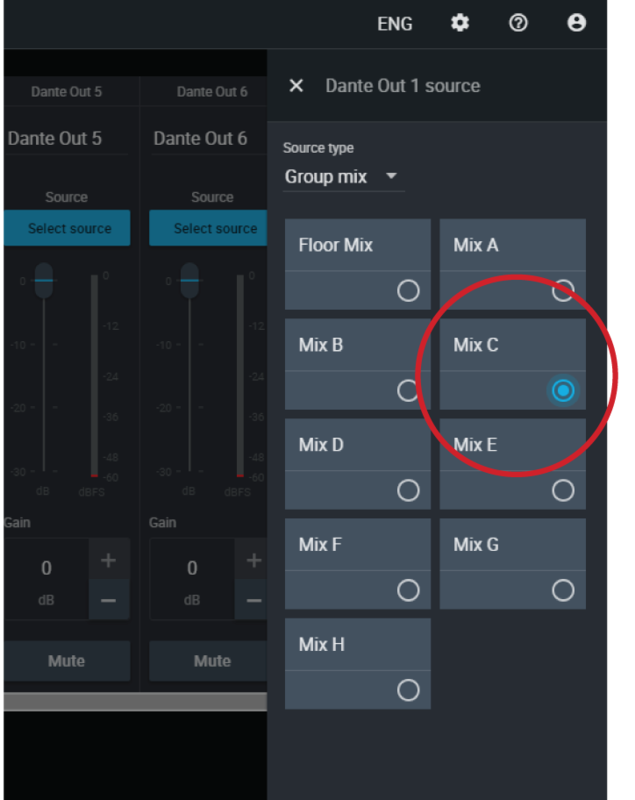 For the first Dante output channel, select Mix A for the input source. Repeat for the rest of the outputs. To record more than 8 active speakers at a time, route the 8 microphone slots (instead of seats routed to mixes) to the output channels. Keep in mind that the channels will not be permanently assigned to certain participants. The wireless 8 microphone slots 'fill up' starting with slot 1 and increasing with more active microphones. (Slot 1 is always filled whenever a microphone is active.) Therefore this method allows clean recordings, but the labeling will not follow the participants by seat. Set the number of active microphones and delegate microphones to 8 (maximum). For the first Dante output channel, select Microphone slot 1 for the input source. Repeat for the remaining microphone slots. To prepare for an emergency, connect an Emergency Evacuation Message (EEM) audio signal to the analog XLR input or one of the 10 Dante input channels. The system will detect when the EEM signal is present and distribute it to the loudspeakers and all output connections. Go to Audio > Inputs. Open the dropdown menu and connect the EEM signal to a Dante channel (example: Dante input 1) or the XLR connector on the access point. Note: Audio returns to normal after being below the threshold for 5 seconds. There are 8 audio channels used for language interpretation. In multilingual meetings, participants speak their native language into the microphone and listen to the interpretation on headphones. Conference units include a headphone output for listening to interpreter channels or other participants on the floor channel. Each participant chooses their channel from the conference unit touchscreen. Participants select one of the channels to listen to their language during a multilingual event. The audio source comes from the analog input or one of the Dante inputs. The floor channel is used by interpreters to provide simultaneous interpretation of the discussion. 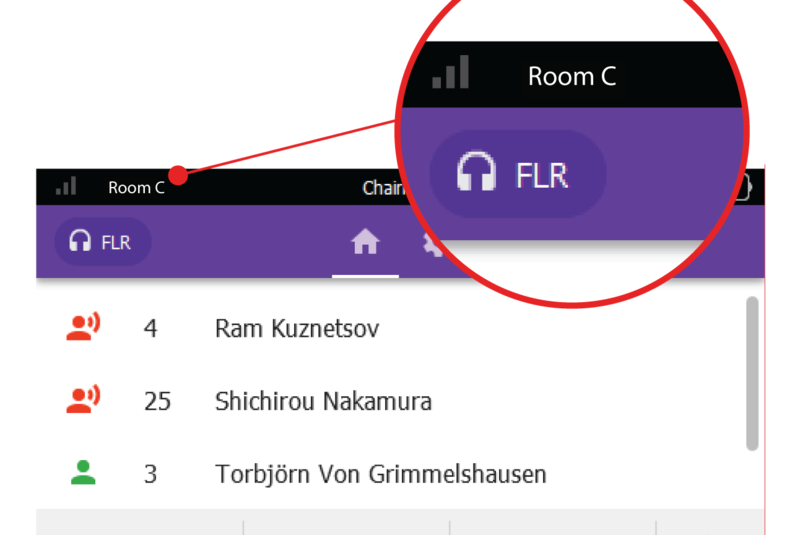 This channel is also selectable by other participants to listen to the floor channel on headphones. Connect headphones to a headphone jack on one of the sides of the conference unit. headphone icon on the touchscreen and select a channel from the list. Adjust the volume of the headphones using the control knobs on the unit. Use the access point web application to set up interpretation channels for conference units. Go to Meeting Controls > Interpretation. 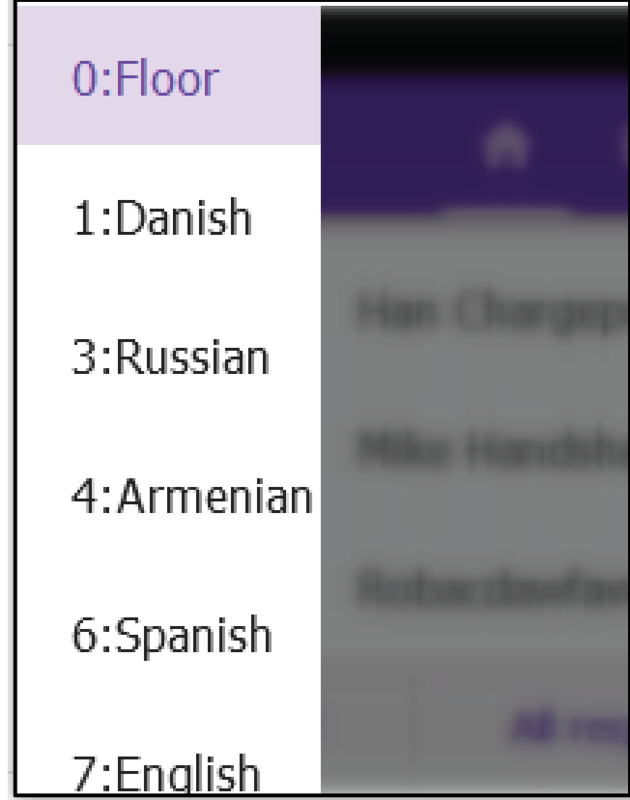 Select the desired language from the dropdown. Press Assign Source and choose from the available analog input or 10 Dante inputs. Click the channel slider to turn the interpretation channel on. Repeat the above steps to create up to 8 interpretation channels. Dantetm digital audio is carried over standard Ethernet and operates using standard Internet Protocols. Dante provides low latency, tight clock synchronization, and high Quality-of-Service (QoS) to provide reliable audio transport to a variety of Dante devices. Dante audio can coexist safely on the same network as IT and control data, or can be configured to use a dedicated network. 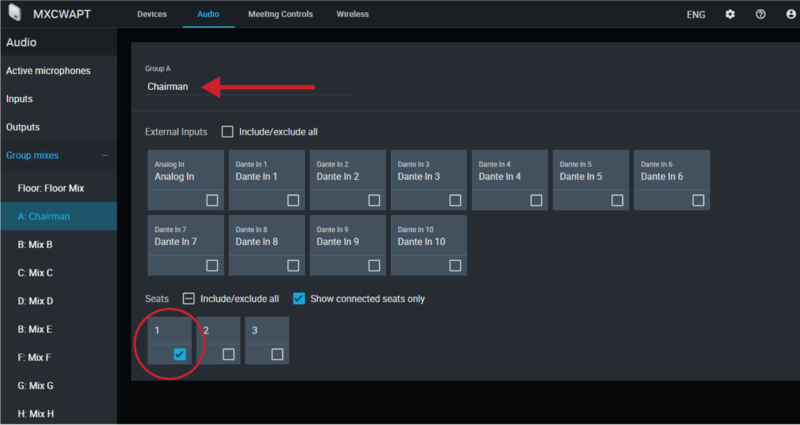 Connect your Dante audio network to the MXCW system. Use the free Dante Controller software by Audinate® to route Dante channels in and out of the MXCW system. QoS settings assign priorities to specific data packets on the network, ensuring reliable audio delivery on larger networks with heavy traffic. This feature is available on most managed network switches. Although not required, assigning QoS settings is recommended. Note: Coordinate changes with the network administrator to avoid disrupting service. To assign QoS values, open the switch interface and use the following table to assign Dante-associated queue values. Use descending priority values for each remaining packet. Note: Switch management may vary by manufacturer and switch type. 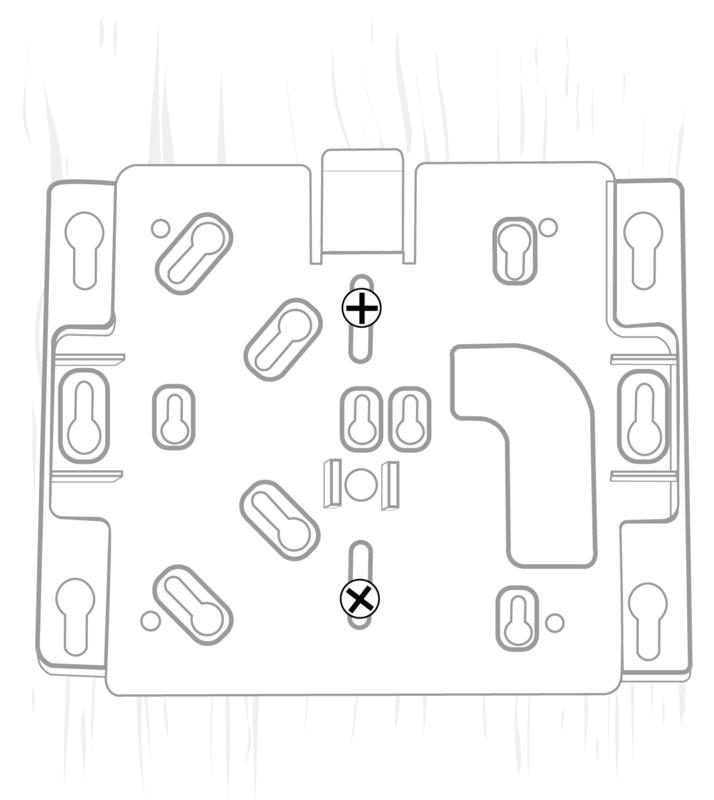 Consult the manufacturer's product guide for specific configuration details. For more information on Dante requirements and networking, visit www.audinate.com. 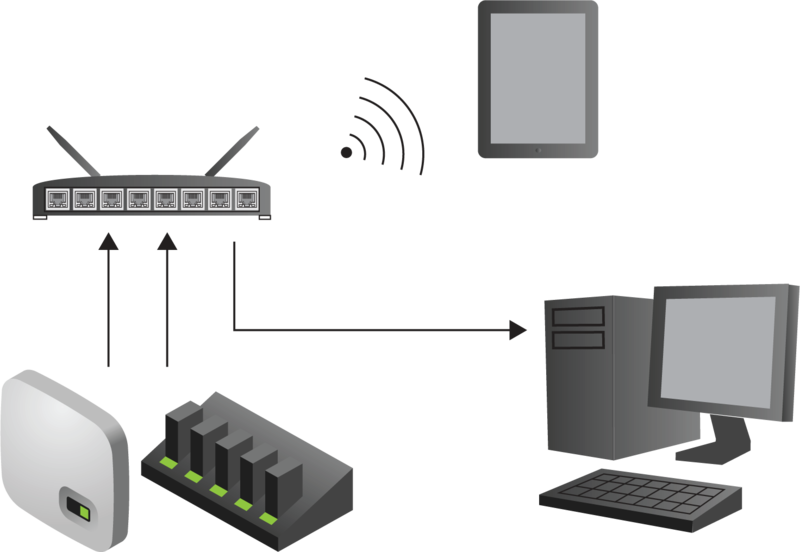 Packet bridge enables an external controller to obtain IP information from the control interface of a Shure device. To access the packet bridge, an external controller must send a query packet over unicast UDP* to port 2203 on the Dante interface of the Shure device. Send a UDP packet with a minimum 1-byte payload . Note: The maximum accepted payload 140 bytes. Any content is allowed. Note: The Shure device should respond in less than one second on a typical network. If there is no response, try sending the query again after verifying the destination IP address and port number. Always use a "star" network topology by connecting each component directly to the switch or router. 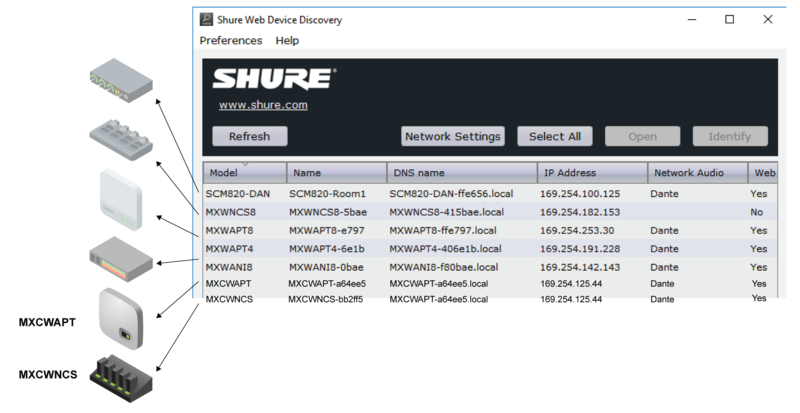 Connect all Shure networked devices to the same network and set to the same subnet. This applies to all devices that audio signals must be routed between (managed through Dante Controller). It is also required in order to open the web application for a device. Devices on separate networks require an audio processor or conferencing software to carry audio between them. Use only 1 DHCP server per network. Disable DHCP addressing on additional servers. Power on the switch and DHCP server prior to MXCW equipment. To expand the network, use multiple Ethernet switches in a star topology. All devices must be at the same firmware revision level. Auto (DHCP): For automatic assignment of IP addresses. Manual (Static): For Static IP addresses. View and edit the IP Address, Subnet Mask, and Gateway for each network interface. The network interface's unique identification. IP configurations are managed through the web application or the access point LCD screen. By default, they are set to Automatic (DHCP) mode. DHCP mode enables the devices to accept IP settings from a DHCP server, or automatically fall back to Link-Local settings when no DHCP is available. IP addresses may also be manually set. Select Automatic or Manual. If Automatic is used, addresses will be automatically assigned. See Manually Assigning Static IP Address for Manual setup. Go to the Settings tab and select Network. Select Manual as the IP configuration. Enter the IP address, Subnet mask, and Gateway address. Latency is the amount of time for a signal to travel across the system to the outputs of a device. To account for variances in latency time between devices and channels, Dante has a predetermined selection of latency settings. 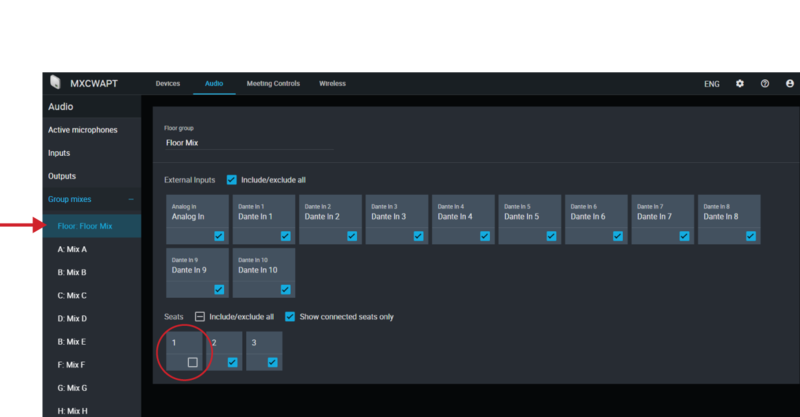 When the same setting is selected, it ensures that all Dante devices on the network are in sync. These latency values should be used as a starting point. 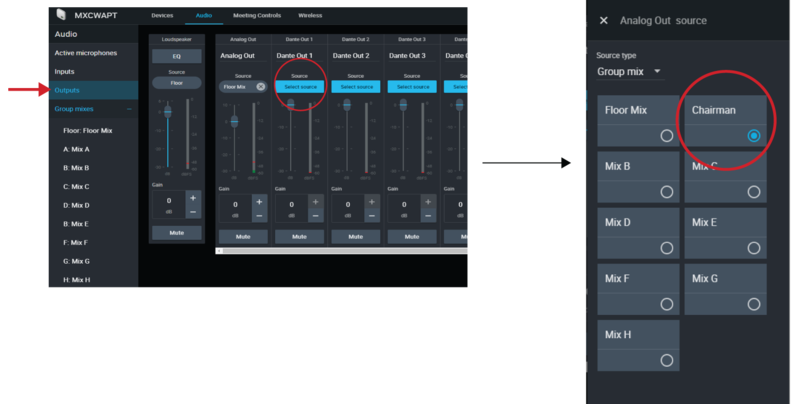 To determine the exact latency to use for your setup, deploy the setup, send Dante audio between your devices, and measure the actual latency in your system using Audinate's Dante Controller software. Then round up to the nearest latency setting available, and use that one. Use Audinate's Dante Controller software to change latency settings. When operating the web application with a wireless connection, it’s important to set up the wireless router properly for best performance. The system employs several standard-based protocols that rely on multicast. The wireless connection treats broadcast and multicast packets differently than general packets for backward compatibility reasons. In some cases, the wireless router will limit the multicast packet transmission rate to a value that is too slow for web application to properly operate. Wireless routers typically support 802.11b, 802.11a/g, and/or 802.11n standards. By default, many wireless routers are configured to allow older 802.11b devices to operate over the network. In this configuration, these routers will automatically limit the multicast data rates (or sometimes referred to as ‘basic rate’, or ‘management rate’) to 1-2Mbps. Note: A wireless connection can only be used for the control software. Network audio cannot be transmitted over a wireless connection. Tip: For larger wireless microphone configurations, it’s recommended to increase the multicast transmission rate to provide adequate bandwidth. Important: For best performance, use a wireless router that does not limit the multicast rate to 1-2 Mbps. *These ports must be open on the PC or control system to access the device through a firewall. †These protocols require multicast. Ensure multicast has been correctly configured for your network. 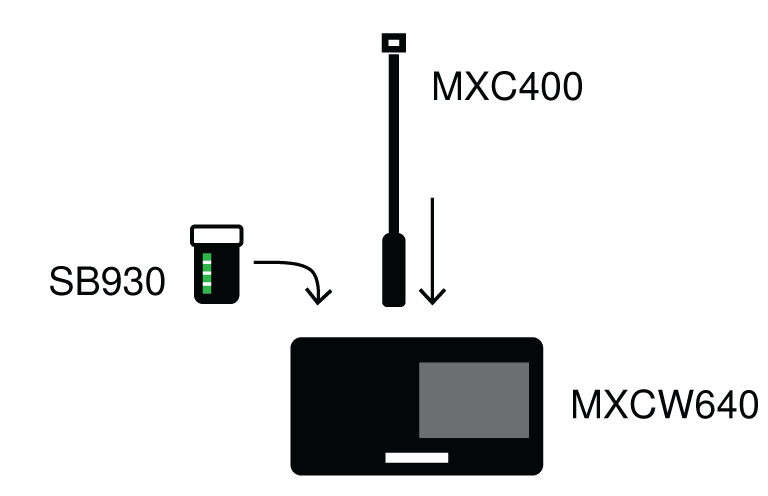 The system allows any MXCW wireless microphones to connect to the SSID network and automatically join the audio system. But depending on the requirements of your application, you may want to configure the system to restrict connectivity. These settings only affect additional devices not already present in the registered device list. Conference units already connected and registered are allowed to reconnect automatically. To edit the network and audio connection of additional conference units, open the MXCW web application and go to Settings > Hardware. Open: Allow new devices to connect to the access point network. Connected devices can be controlled and edited from the web application. Closed: Prevent new devices from connecting to the access point network. Registration is the final step that connects the conference unit to the MXCW audio system. By default, conference units automatically register once they are connected. 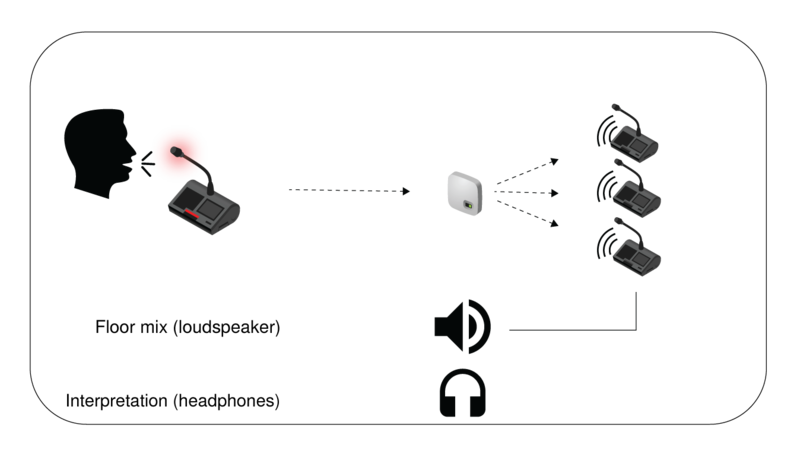 Automatic Additional devices automatically register to the access point (audio passing). This allows devices to quickly join the event without additional set up. Manual Additional devices connect as unregistered (control but no audio). At any time, the administrator can register it from the Devices tab of the MXCW web application. Power cycling the access point resets the audio and network connection settings. To remember your setting, set the connections to closed and manual before each power cycle. Find the desired device and select the box next to its icon. Open more options and press Deregister. Select more wireless channels If any wireless channels are deselected, add them back to the wireless scan in the web application: > SELECT WI-FI CHANNELS. Lower the RF power in the web application: Wireless > RF power. This improves signal-to-noise ratio but does not eliminate the interference. Go to the web applicaton: > RF power. Relocate the MXCW access point Move the access point to another point in the room. See Select a Location for the Access Point for more details. Shure devices are designed to work together right out of the box. Prior to a new installation, or during troubleshooting, it may be useful to reset devices to ensure system compatibility. Network reset: Clears only network settings and provides a fresh network connection. System reset: Clears all device and system settings to reset the device to default factory settings. Access Point Press and hold the recessed reset button. Network reset: Press and hold for 5 seconds to reset any network settings and refresh network connection. System reset: Press and hold for 10 seconds to reset the device to default factory settings. See LED Status Indicators for more details on LED behaviors during a reset. Access the technician menu by tapping the gear icon, then tap the right side of the screen while holding down the volume control knobs. Go to the information screen and tap Factory reset. Networked Charging Station Press and hold the recessed reset button. Network reset: Press and hold for 4 seconds to reset any network settings and refresh network connection. System reset: Press and hold for 8 seconds to reset the device to default factory settings. Access Point Go to Settings > Device reset . Select Reboot device or Restore factory defaults. Conference Units Go to Devices and select a device. From the device properties panel, open more options and select Factory reset. Networked Charging Station Go to Settings > Device reset . Select Reboot device or Restore factory defaults. For additional troubleshooting assistance or further information on complex installations, contact Shure to speak with a support representative. In the Americas region, call Systems Support group at 847-600-8440. For users in other locations, go to www.shure.com to find support contact for your region. For digital audio networking help, advanced networking guidelines and Dante software troubleshooting, visit Audinate's website at www.audinate.com. Firmware is embedded software in each component that controls functionality. Periodically, new versions of firmware are developed to incorporate additional features and enhancements. 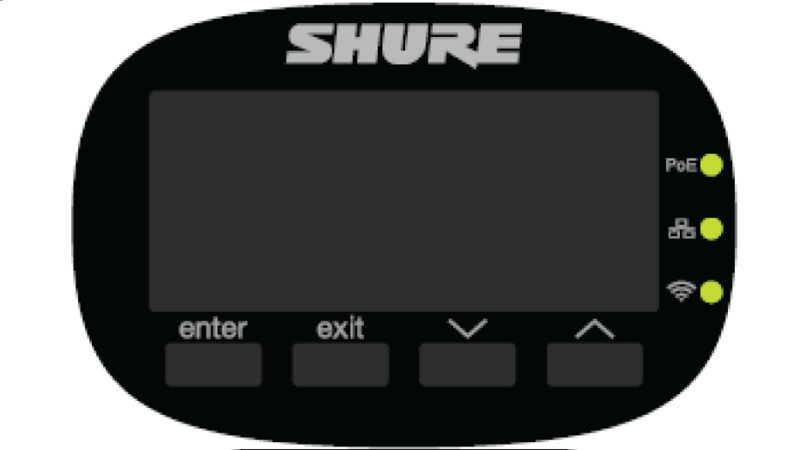 To take advantage of design improvements, new versions of the firmware can be downloaded and installed using the Shure Update Utility tool. Software is available for download from http://www.shure.com/update-utility. 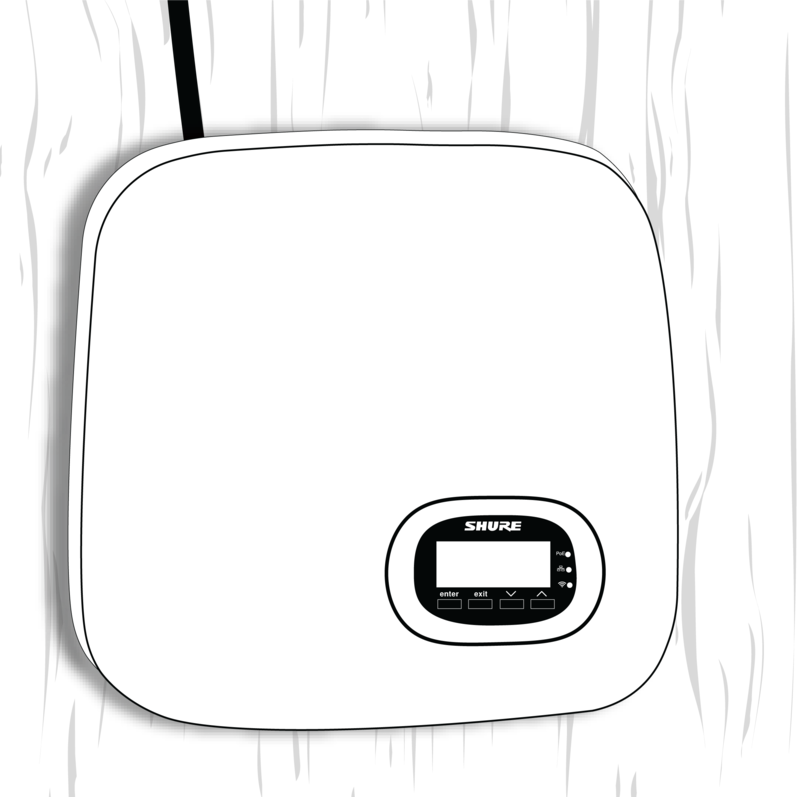 The access point and networked charging station connect to external control systems such as AMX or Crestron via the Ethernet. These devices receive logic commands over the network. Many parameters controlled through the web application can be controlled through a third party control system, using the appropriate command string. Use only one controller per system to avoid messaging conflicts. For a comprehensive list of command strings, visit pubs.shure.com. Line-of-sight to the MXCWAPT. Actual range depends on RF signal absorption, reflection, and interference. 1% THD+N. Audio Injected at Dante Input. All include power cable unless otherwise noted. The possible results of incorrect use are marked by one of the two symbols—"WARNING" and "CAUTION"—depending on the imminence of the danger and the severity of the damage. WARNING: Ignoring these warnings may cause severe injury or death as a result of incorrect operation. CAUTION: Ignoring these cautions may cause moderate injury or property damage as a result of incorrect operation. LISTENING TO AUDIO AT EXCESSIVE VOLUMES CAN CAUSE PERMANENT HEARING DAMAGE. USE AS LOW A VOLUME AS POSSIBLE. Over exposure to excessive sound levels can damage your ears resulting in permanent noise-induced hearing loss (NIHL). Please use the following guidelines established by the Occupational Safety Health Administration (OSHA) on maximum time exposure to sound pressure levels before hearing damage occurs. Installation personnel: This product is designed for specific application and needs to be installed by qualified personnel with RF and related rule knowledge. The general user shall not attempt to install, or to change the settings. This equipment complies with FCC radiation exposure limits set forth for an uncontrolled environment. 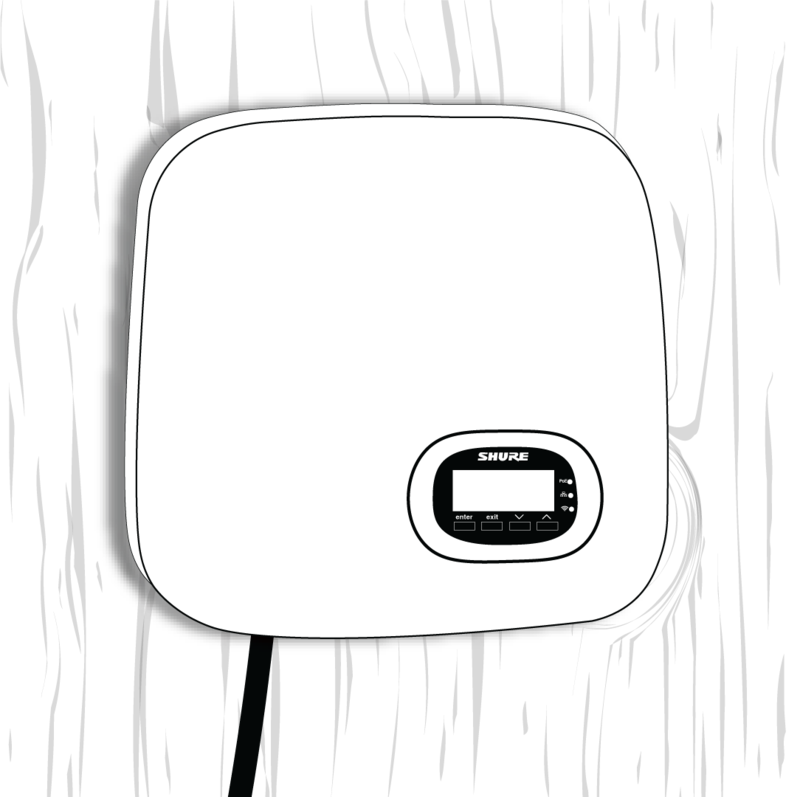 This equipment should be installed and operated with minimum distance 20 cm between the radiator & your body. 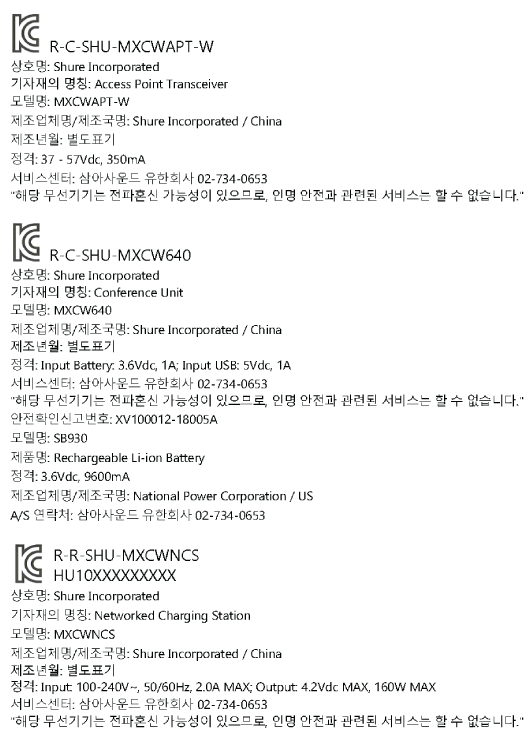 Note: See the label located on the bottom side of the charger enclosure for the FCC marking, the CE marking, the RCM marking, and the electrical ratings. Audinate®, the Audinate logo and Dante are trademarks of Audinate Pty Ltd.